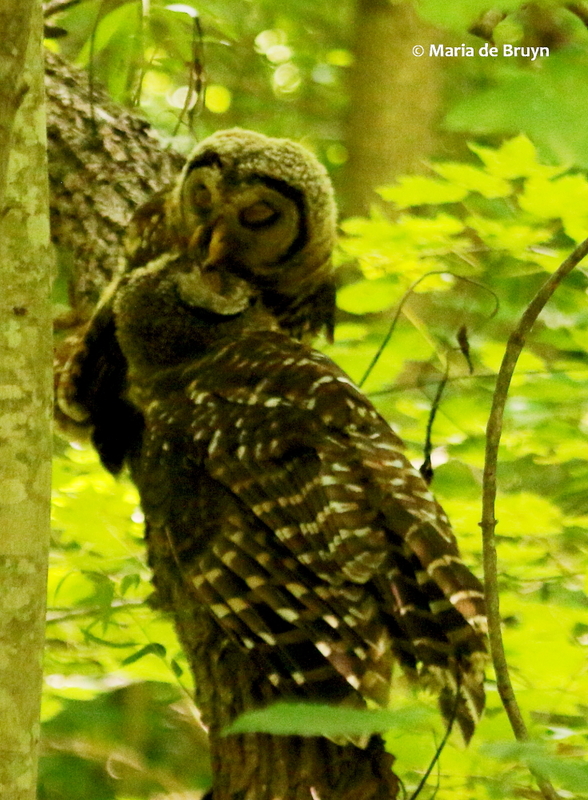 The young barred owls that I observed this past summer at the Mason Farm Biological Reserve could be found rather predictably in two places at the reserve, both of which were near water. 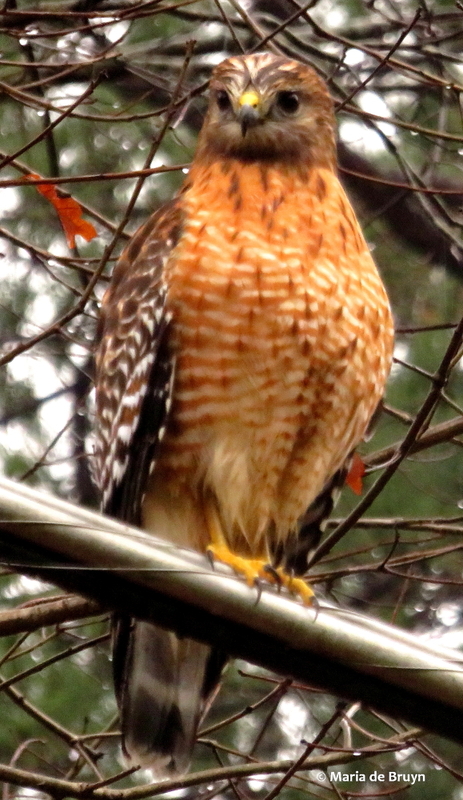 They were quite beautiful to see. 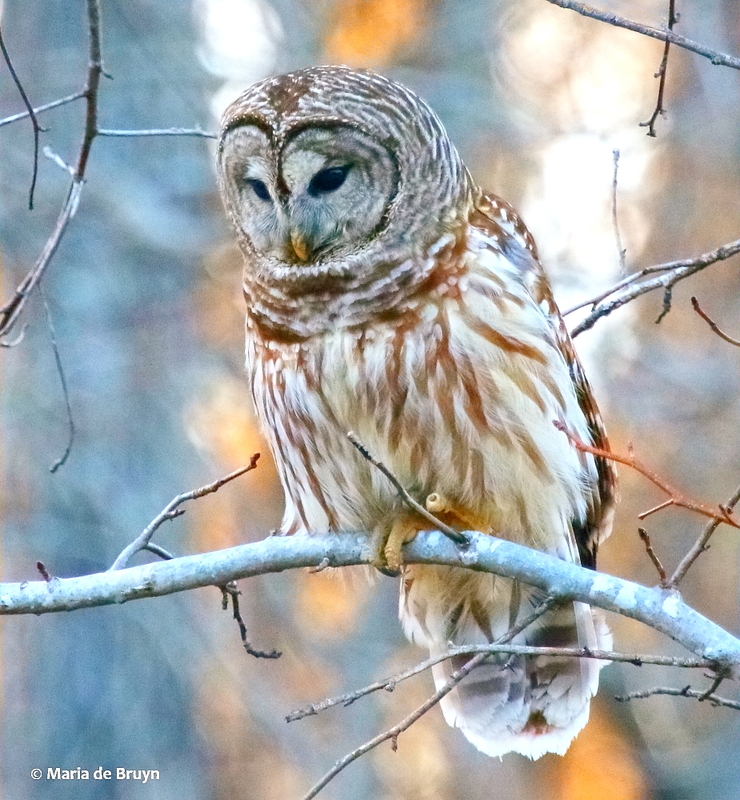 Barred owls (Strix varia) are the only owls in the Eastern USA who have brown rather than yellow eyes. 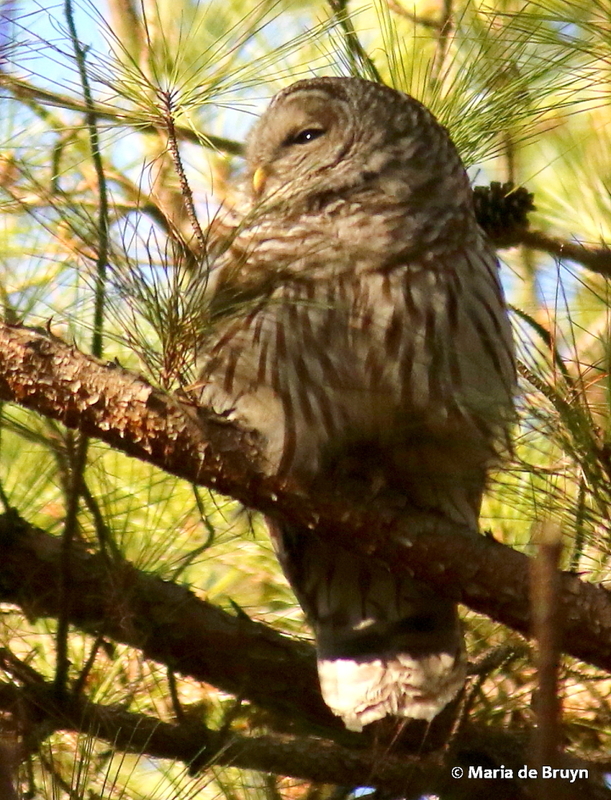 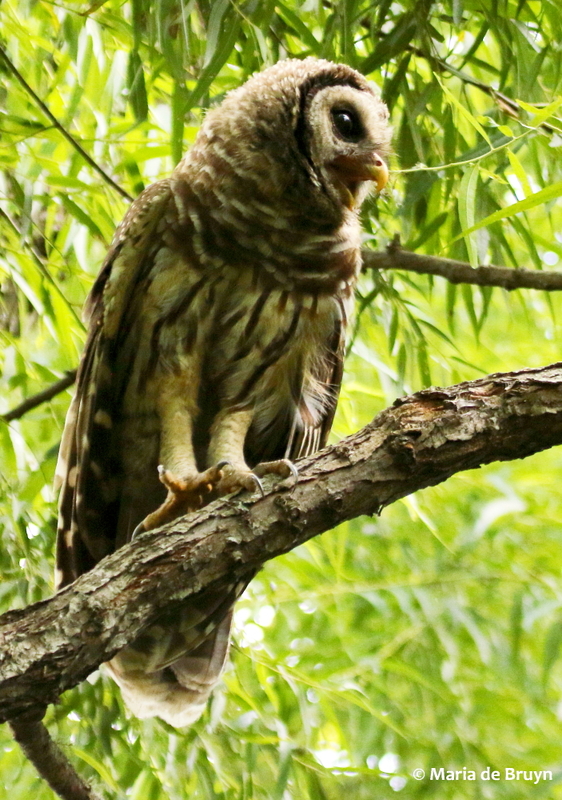 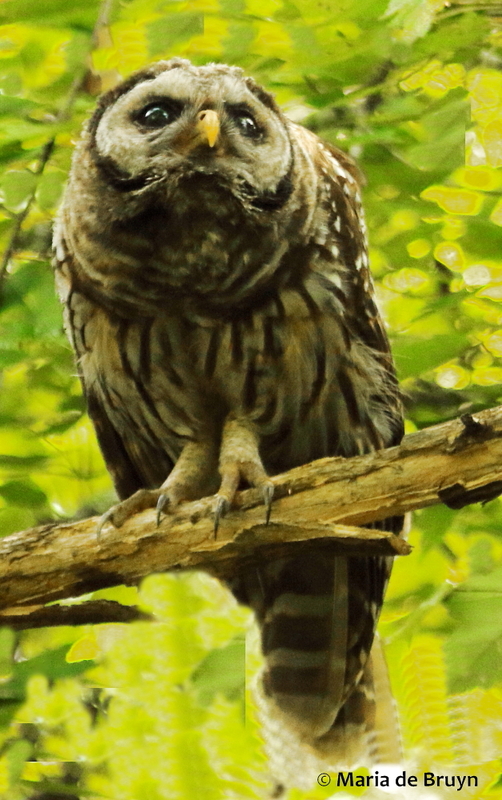 When adult, barred owls have short feathers on their heads but no ear tufts. 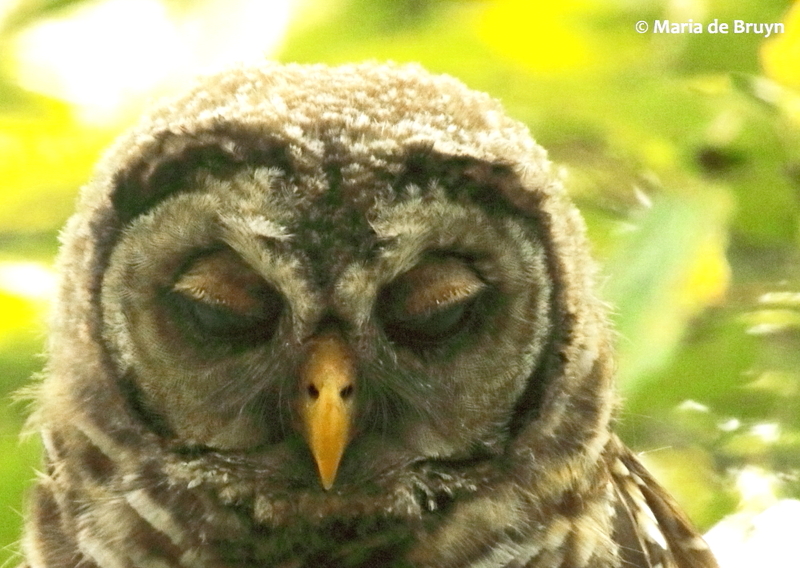 Their eyelids are also feathered. 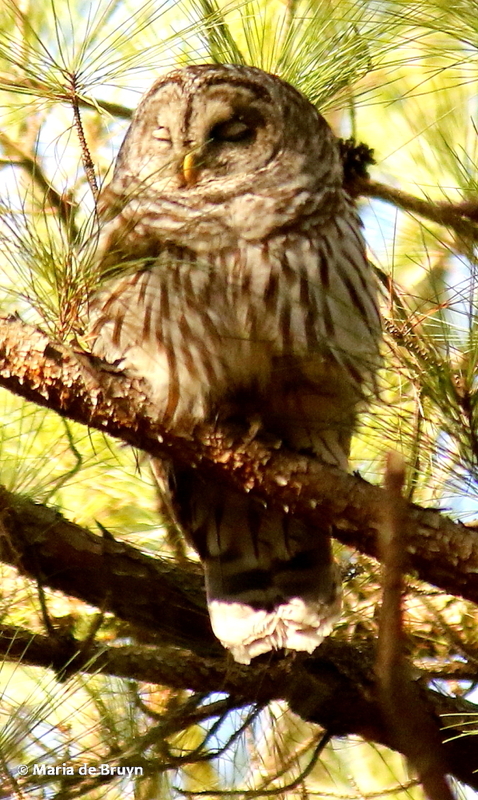 The juveniles still have fuzzy down feathers on their heads and pink, barely feathered, eyelids as you can see here. 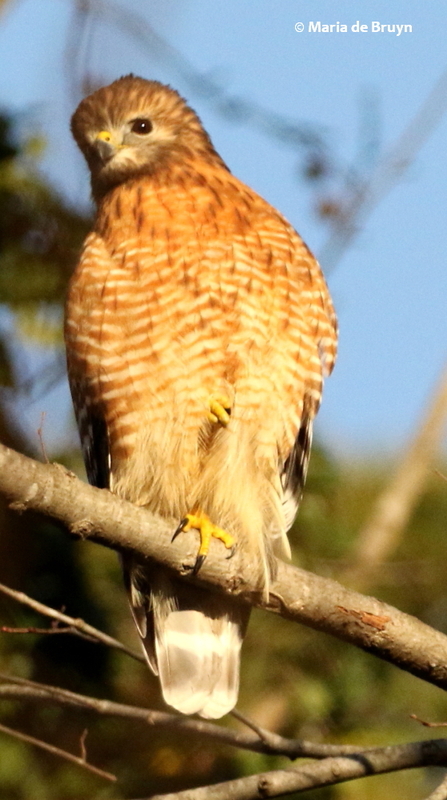 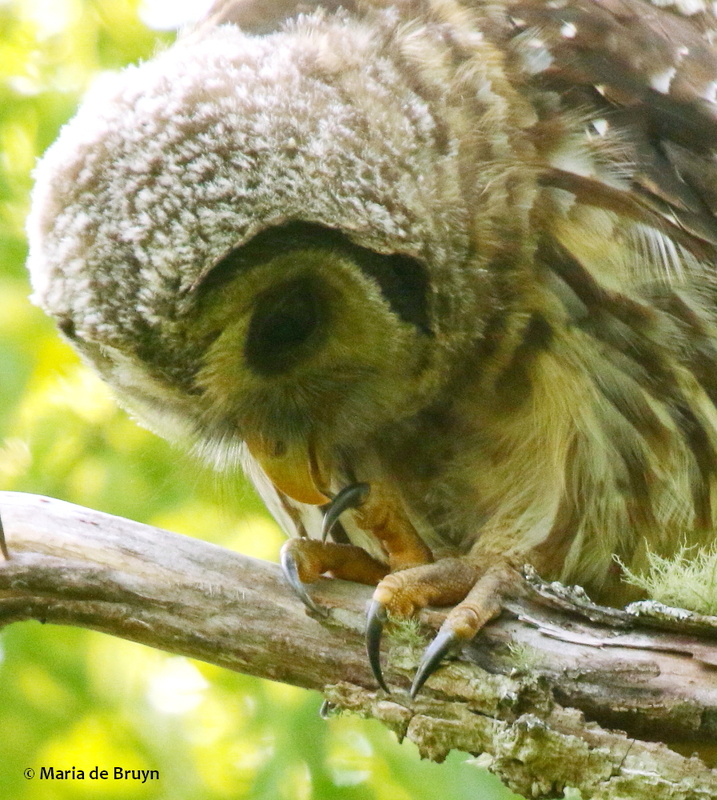 Their feathers extend down their legs and feet right up to their talons. 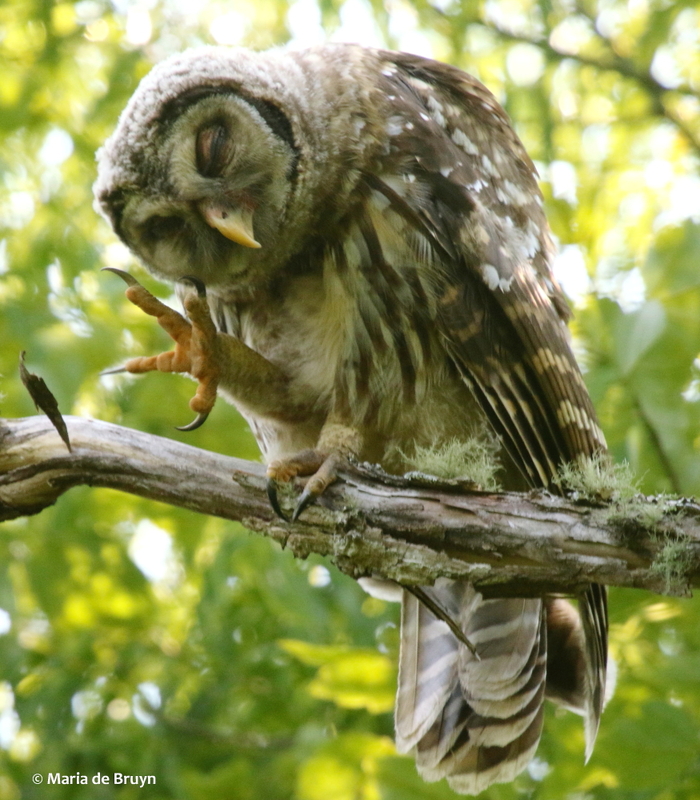 The owls’ claws are less curved than other raptors’ talons which makes it possible for them to squeeze their prey to death. 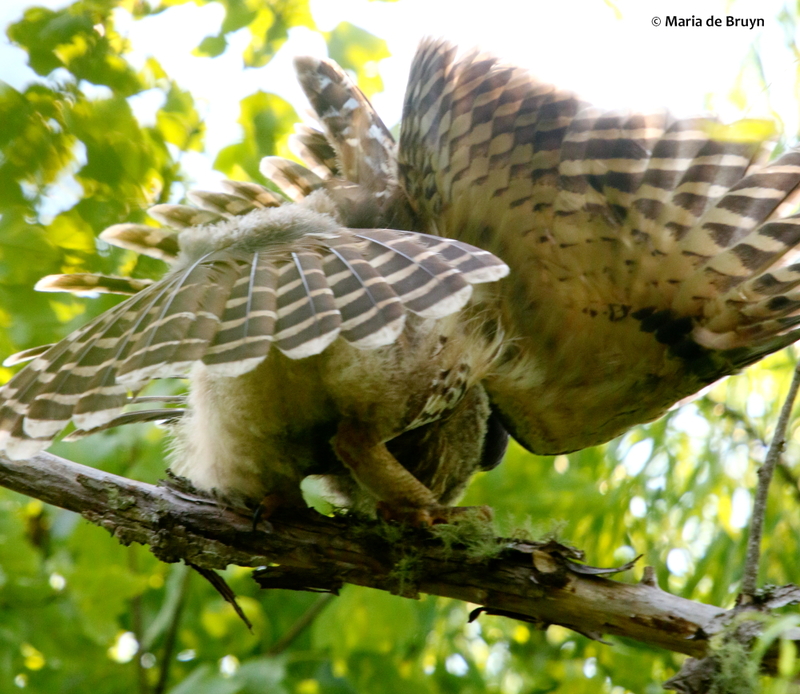 As they grow, the young ones will groom often, pulling out downy feathers. 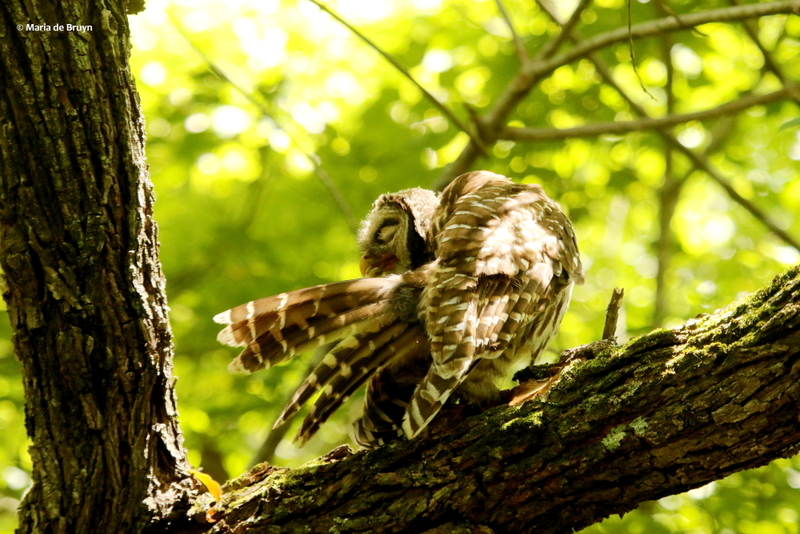 They frequently stretch out their wings and tails when grooming. 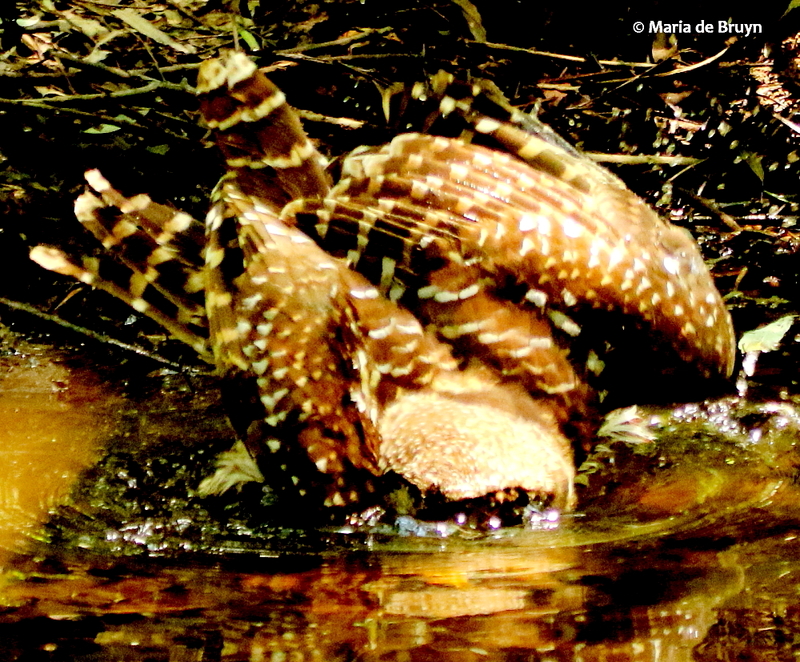 Baths were also a welcome form of personal care. 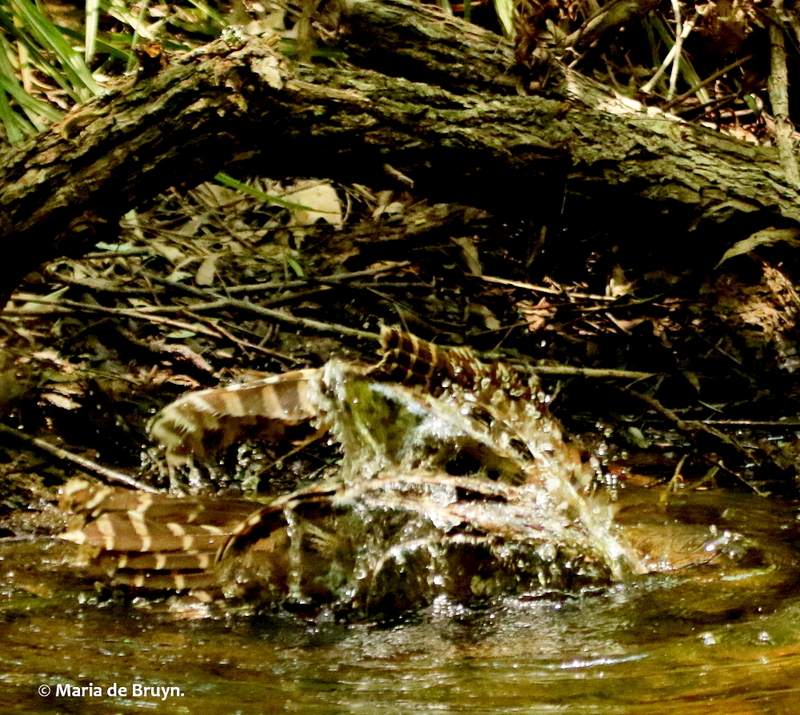 This was especially so during our very hot summer days. 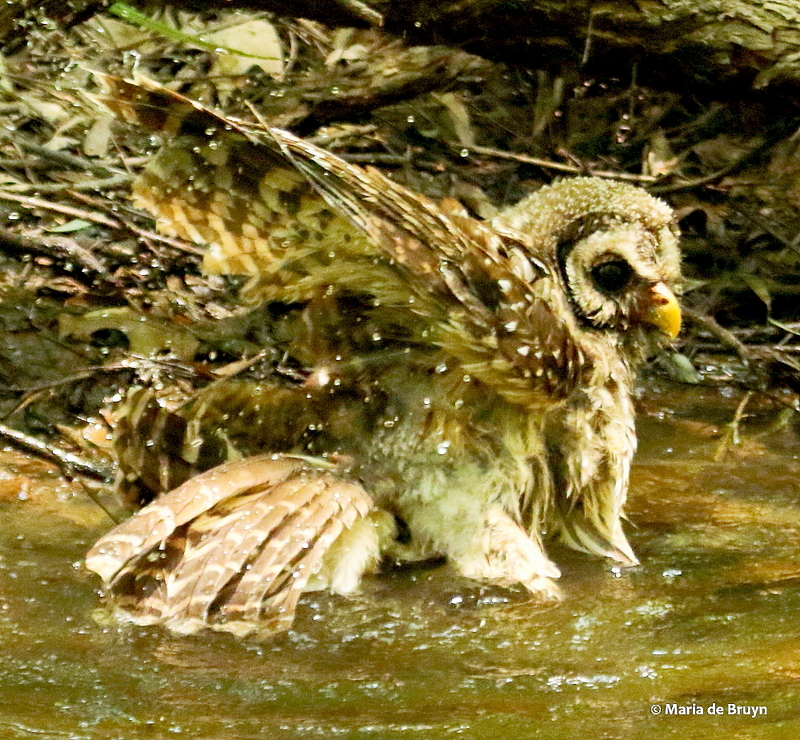 The fact that I was standing about 5 feet away did not deter the owlets from enjoying vigorous dunkings in the water ditch. 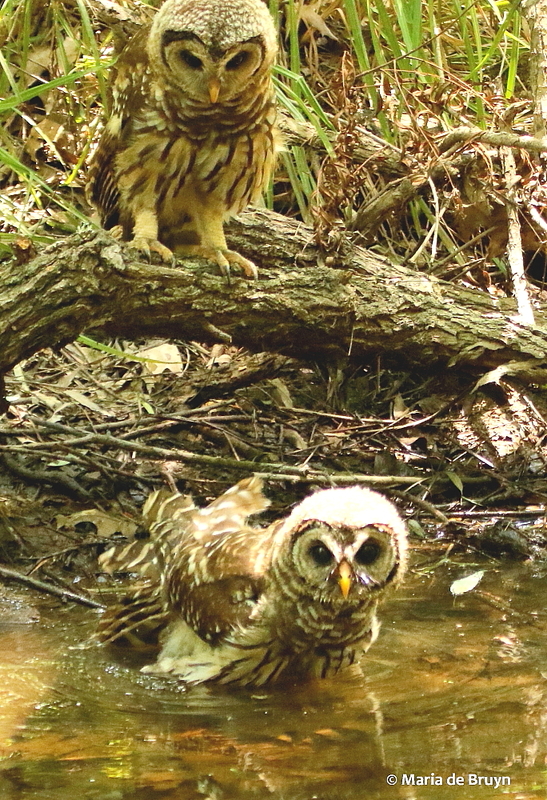 I did not see them bathe at the same time; they appeared to take turns. 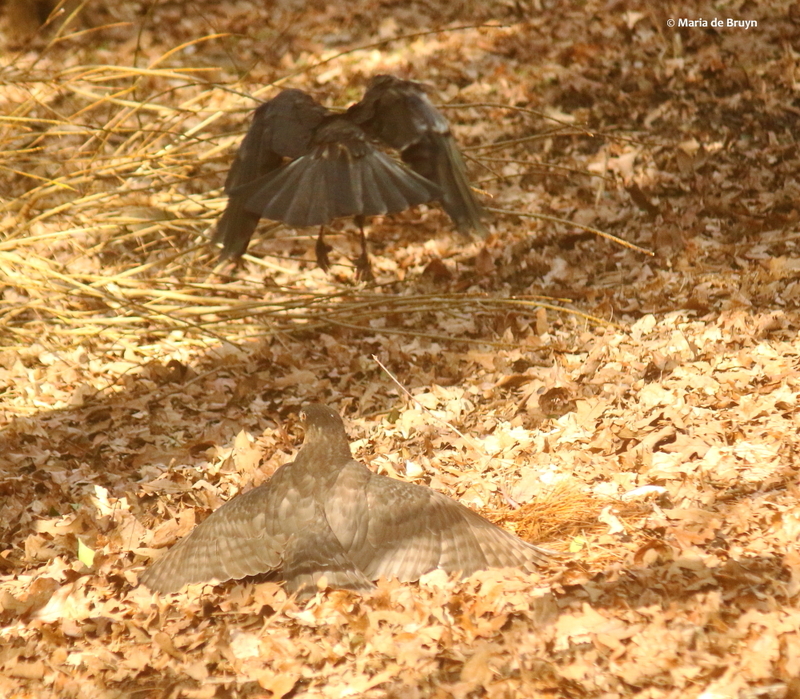 Perhaps each one was keeping watch for the other one when they were vulnerable. 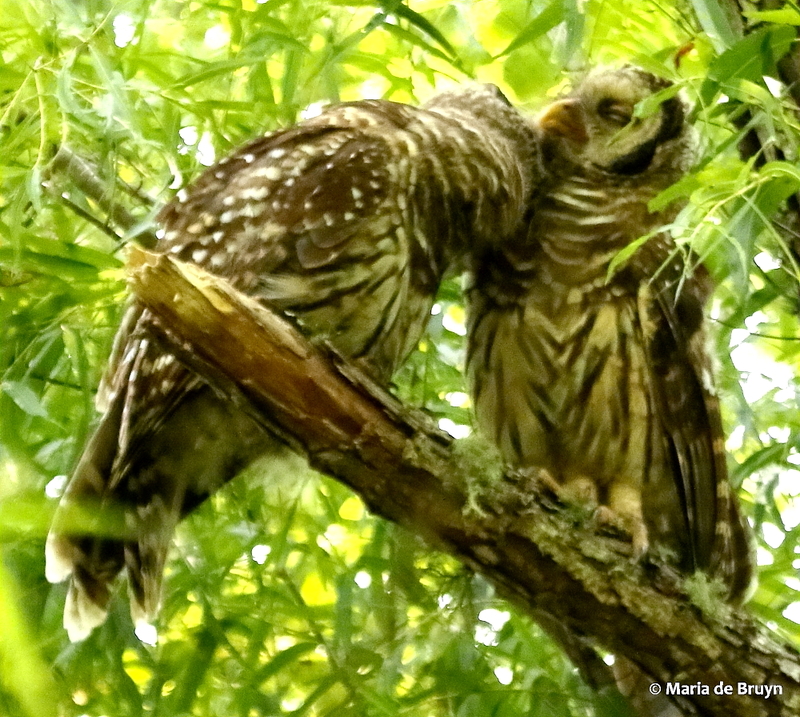 The siblings did indeed seem to be very aware of each other’s activities and when I observed them, they didn’t stray far from one another. 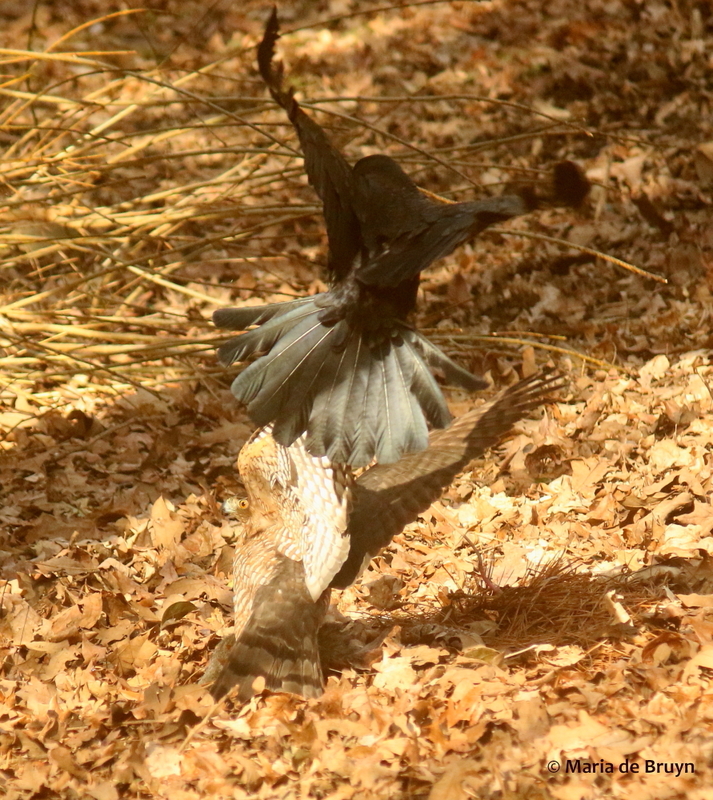 The next blog will show a little of their interactions. 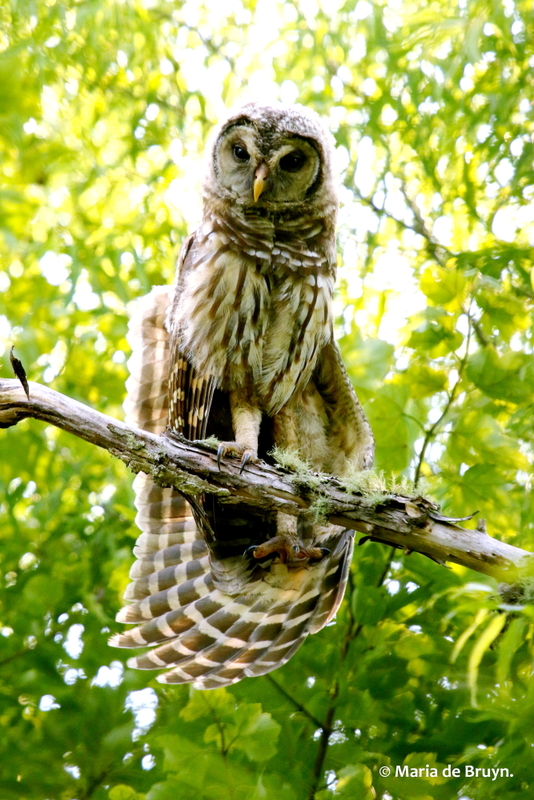 From the ages of about 8-19 years, I lived in a house that had a nice backyard and was not too far from some neighborhood woods with a creek. 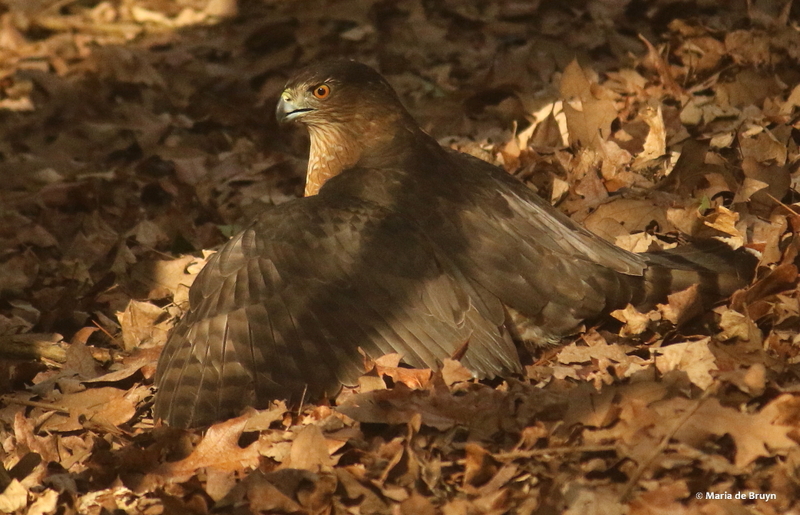 As a child, I read under backyard trees, planted a flower garden and played in the woods with friends. 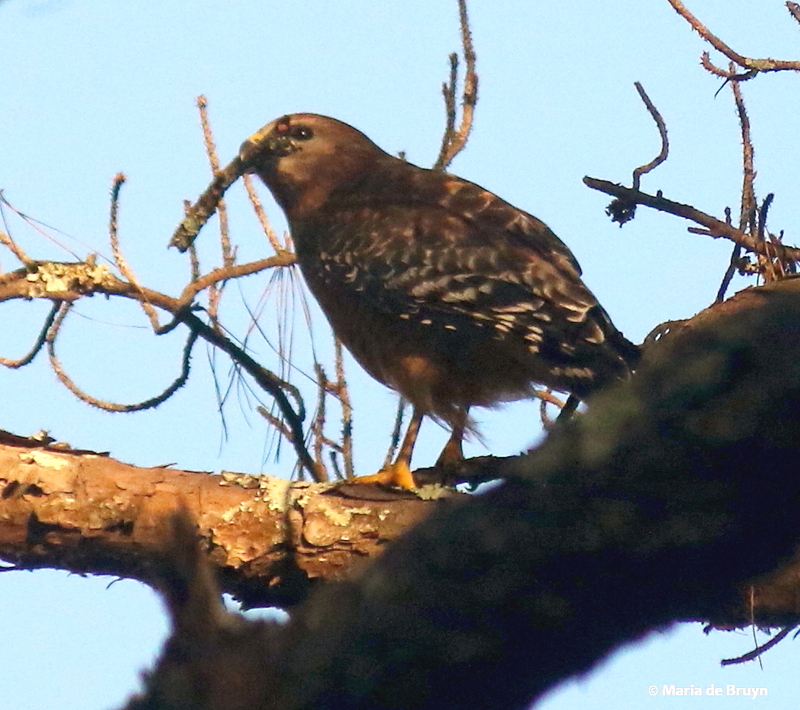 While I became familiar with squirrels, robins, frogs and some bugs and loved being outdoors, I didn’t spend lots of time looking for wildlife. 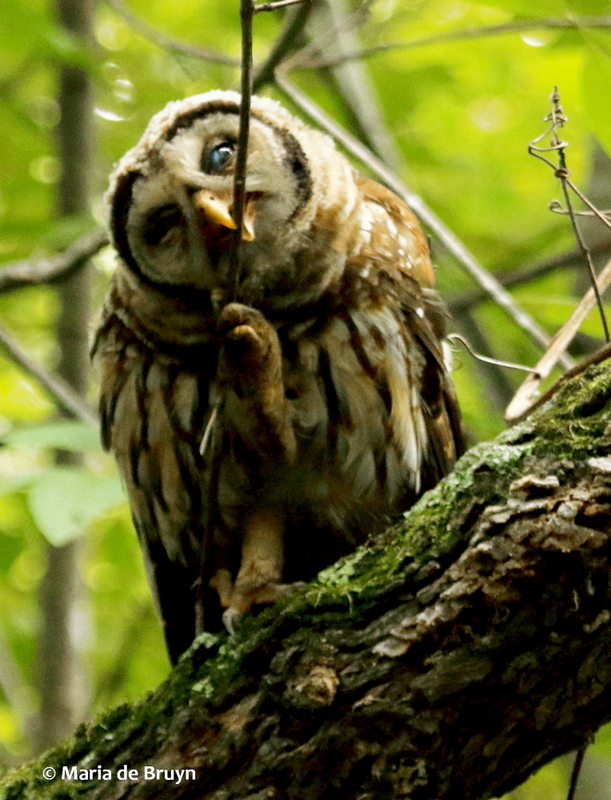 And I never saw an owl in the wild. 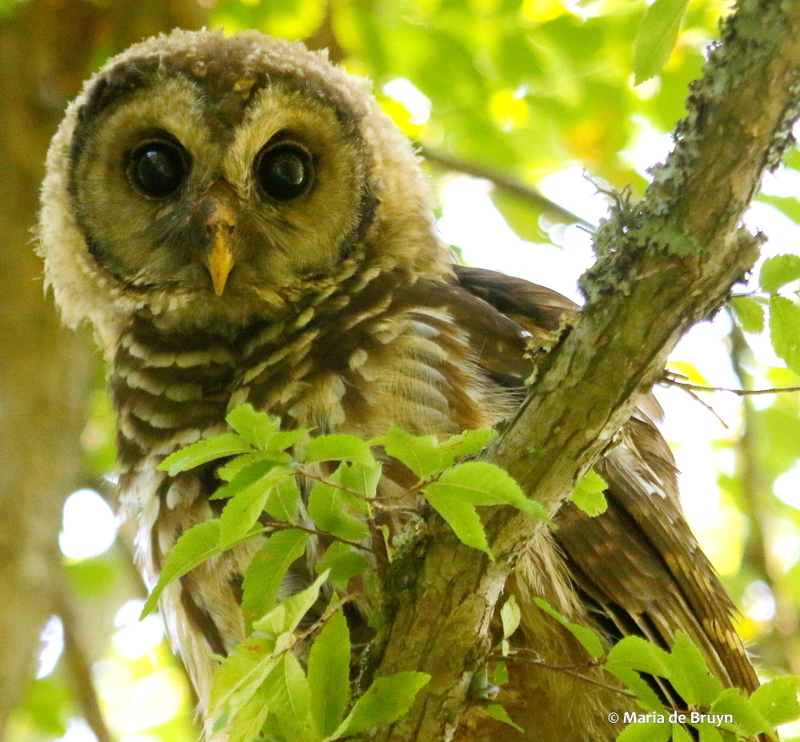 Now decades later, I’ve had the good fortune to learn a good deal about various members of the wildlife community while spending time finding and watching them. 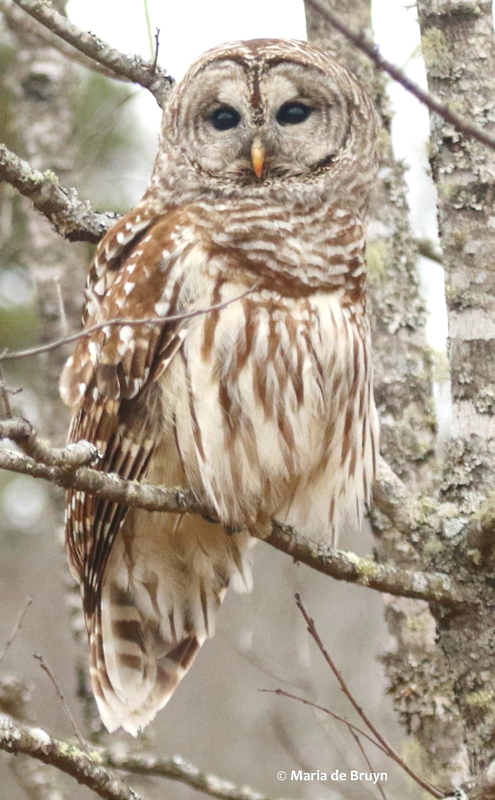 And in the past couple years, I’ve been privileged to see owls up close in the wild; for example, the owl below was perched next to a pathway at dusk when I walked by a few days ago. 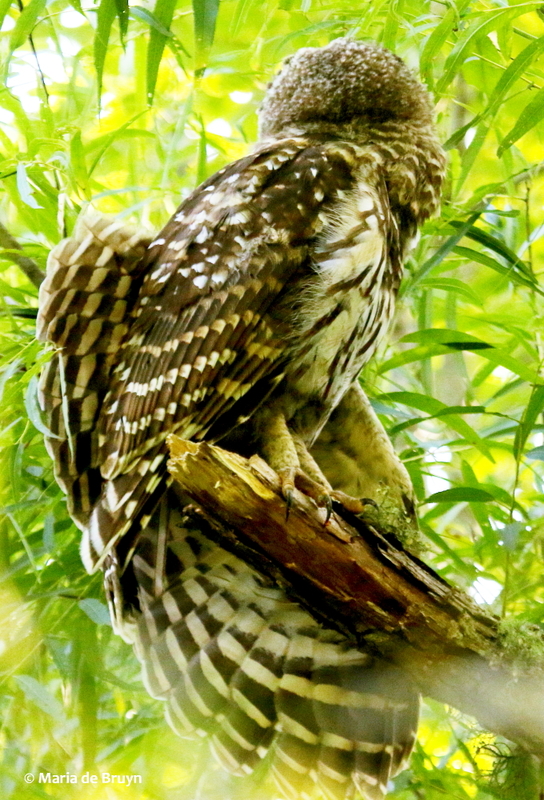 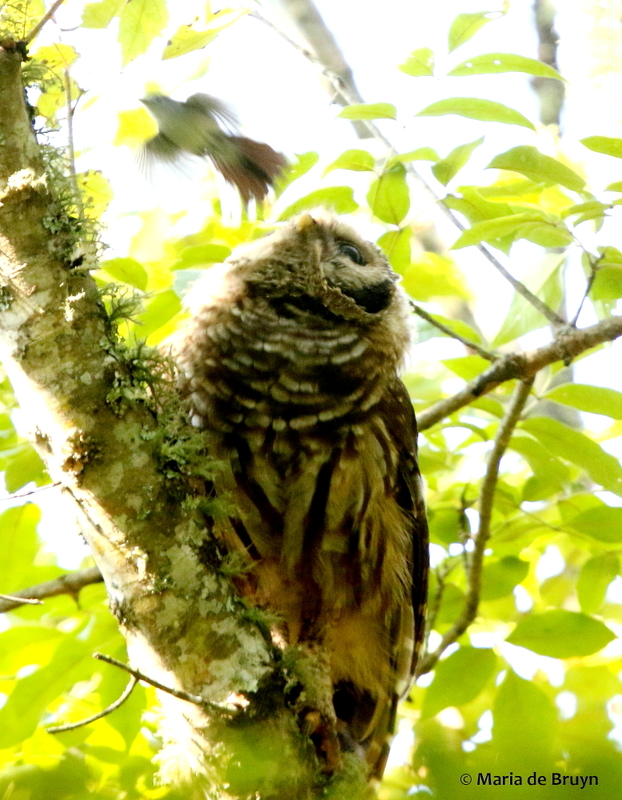 This past summer was unique for me, however, because I was able to observe a pair of juvenile barred owls (Strix varia) at the Mason Farm Biological Reserve as they set off on their life’s journey outside the nest. 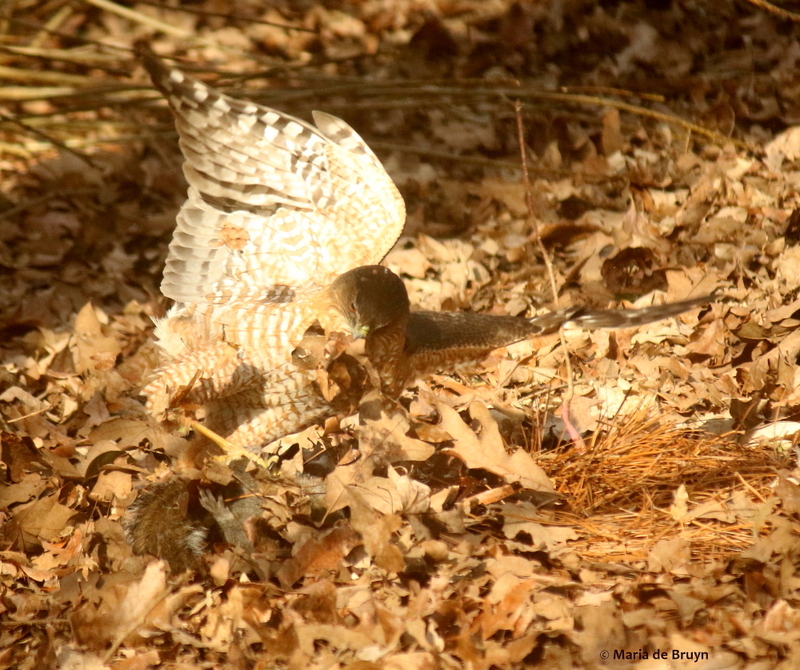 I’d like to share a bit of what I saw with you in a three-part blog. 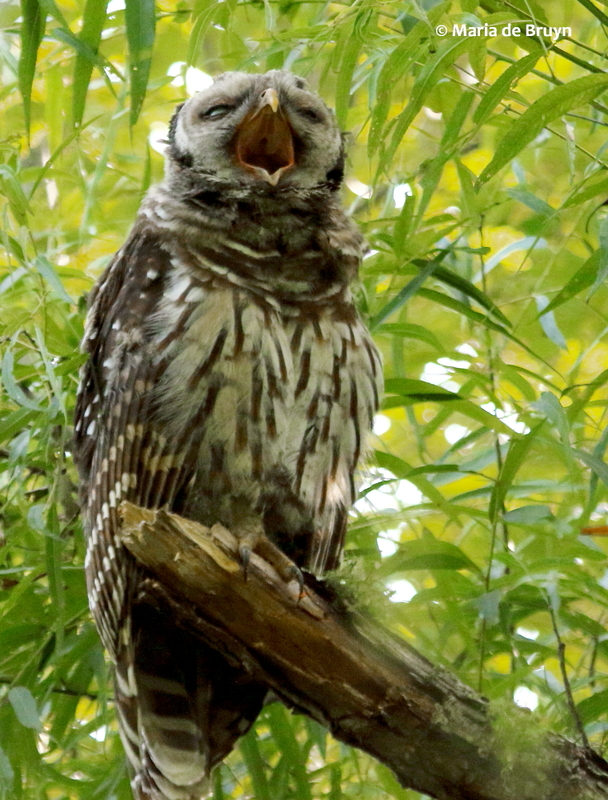 This one is about them finding their independence. 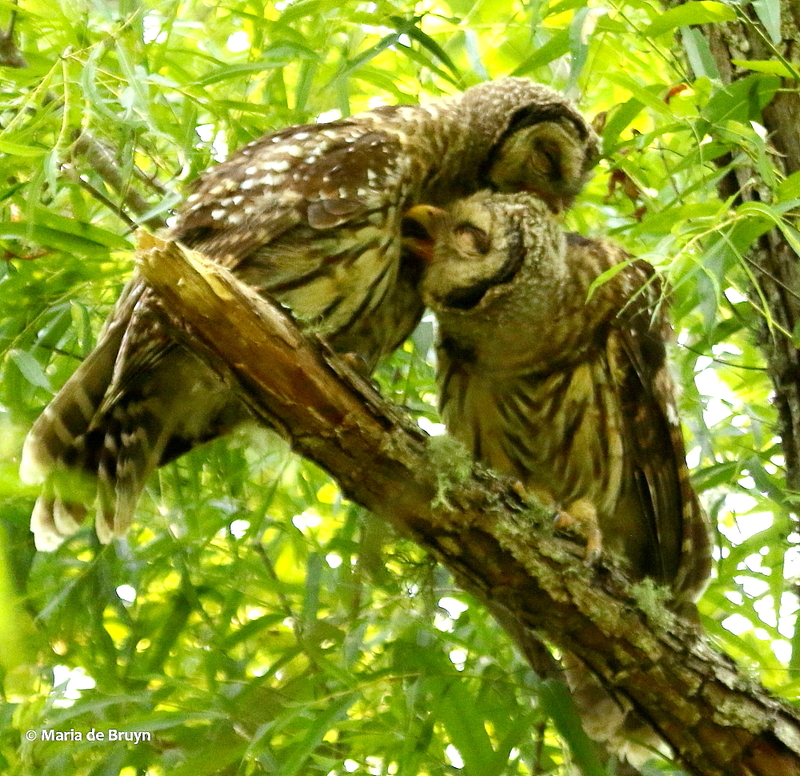 The next two will focus on their grooming and interactions. 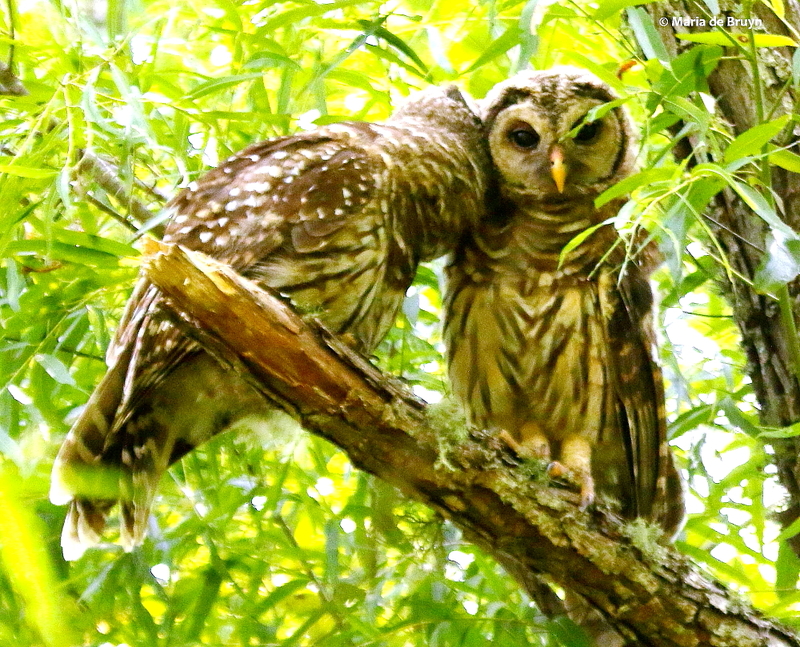 Barred owl pairs usually bond for life; if one mate dies, the survivor will seek another partner soon after. 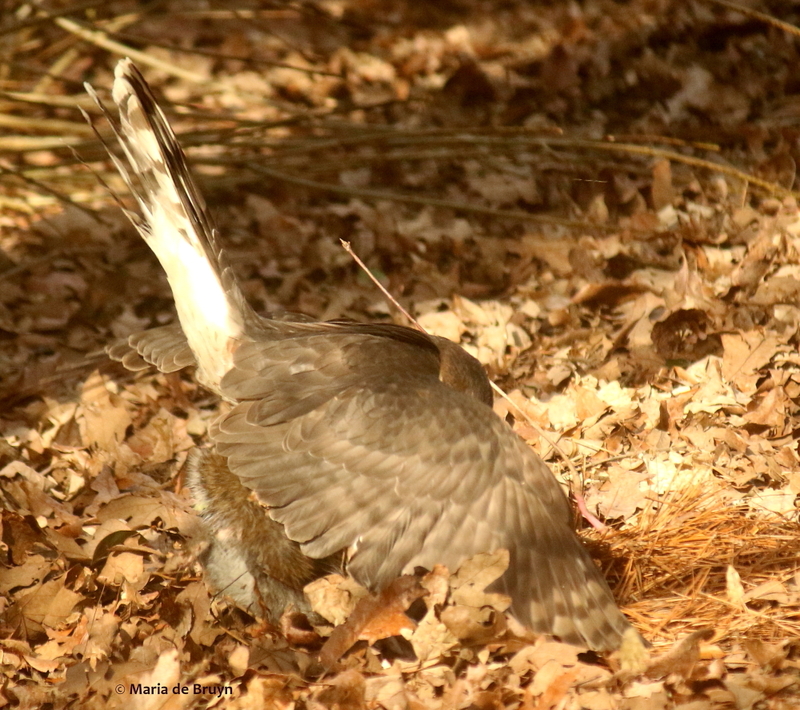 They tend 2-4 eggs, which hatch after 4 weeks’ brooding and the young leave the nest after four or five weeks. 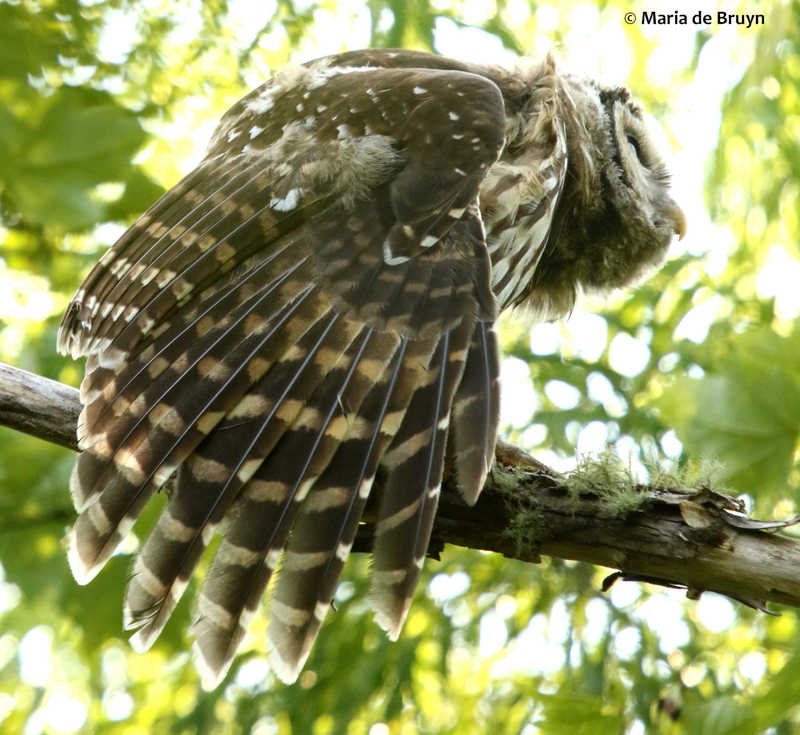 They remain dependent on their parents for food for some time after that even though they may be almost as large as the adults at 16-25 inches in length (40–63 cm); their wing span can stretch up to 3-4 feet (38-49 in, 96–125 cm). 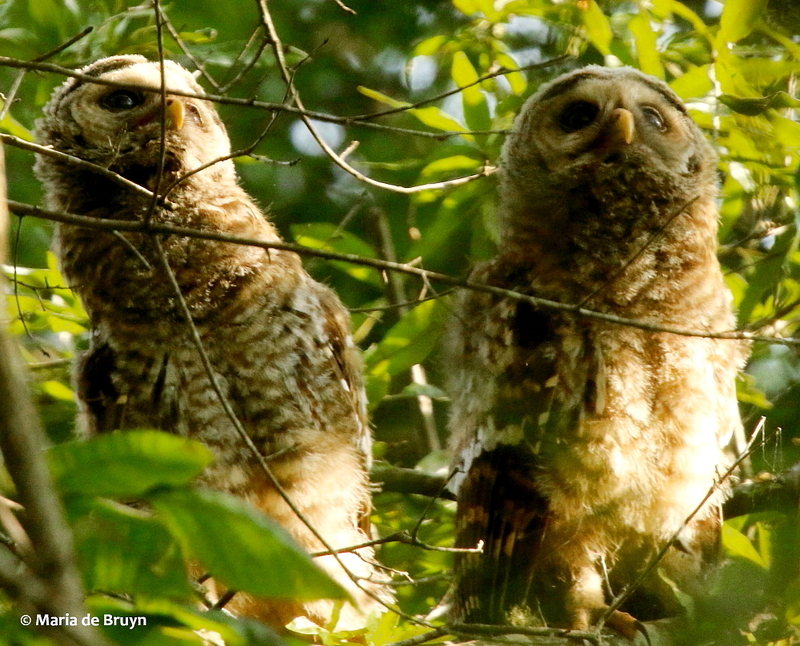 When I first spotted the young owls in June, they could already fly. 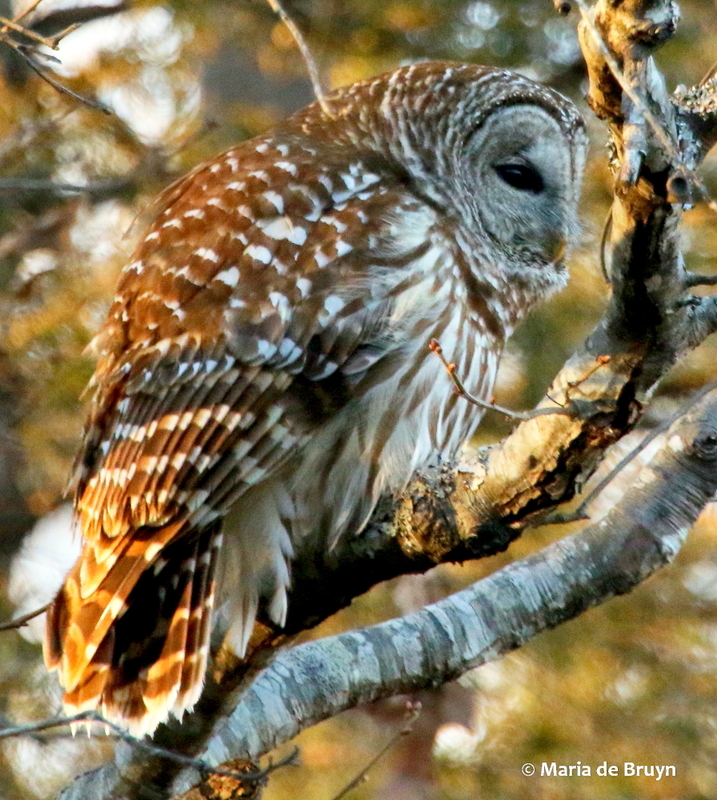 Nevertheless, they did need to find their balance occasionally as they perched and moved along branches and snags. 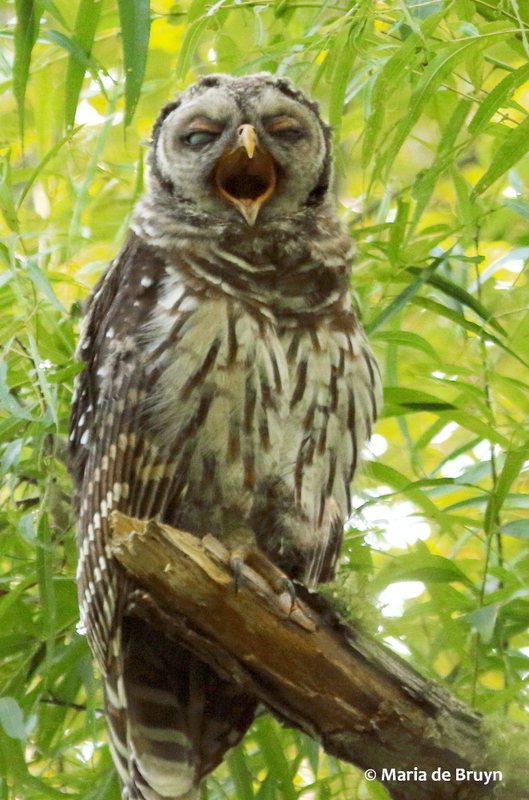 The owlets were making a keening noise the first time I saw them. 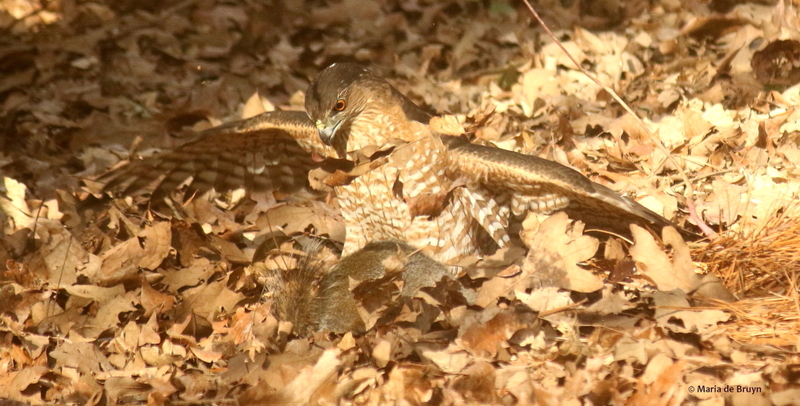 At first, I didn’t recognize it, and I thought perhaps some small mammal was in distress. 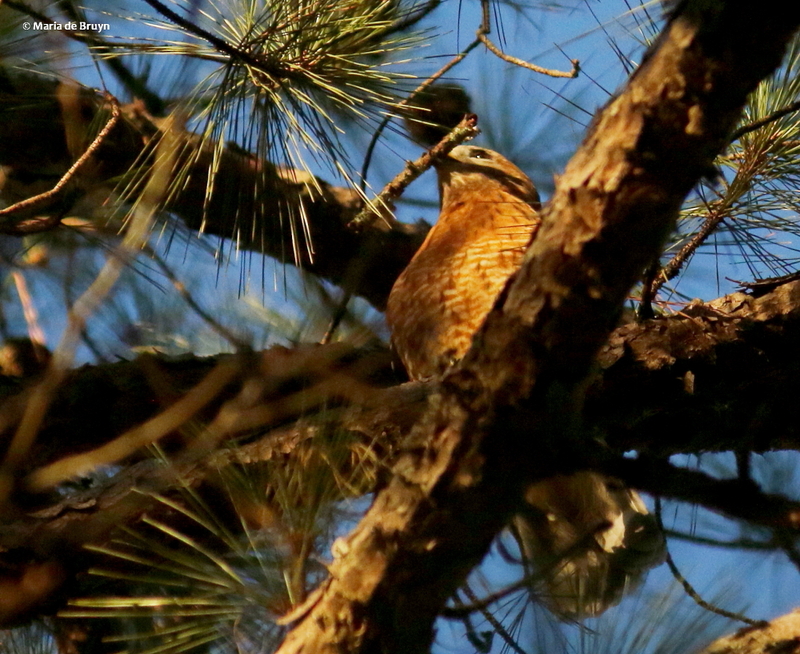 Eventually, the plaintive call helped me locate them above me in a tree. 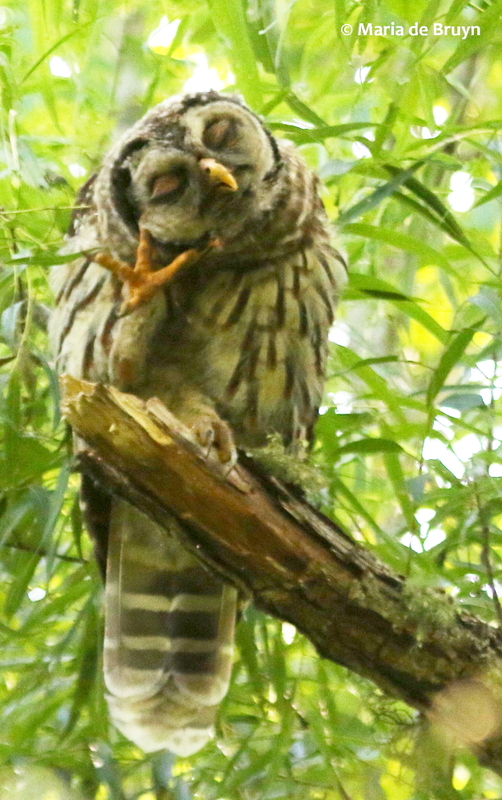 This particular call apparently is used by the babies to call to their parents. 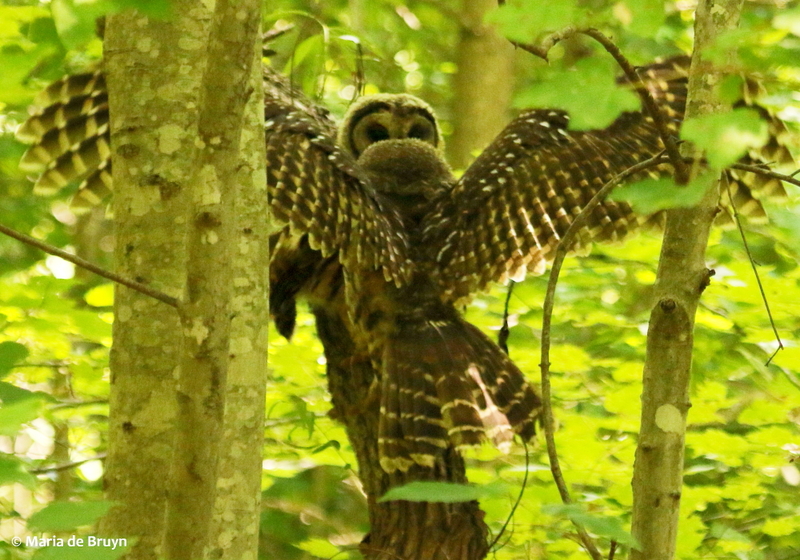 I figured mom or dad was close by as the owlets kept looking upwards and eventually the parents did fly in with a meal – crayfish as far as I could tell. 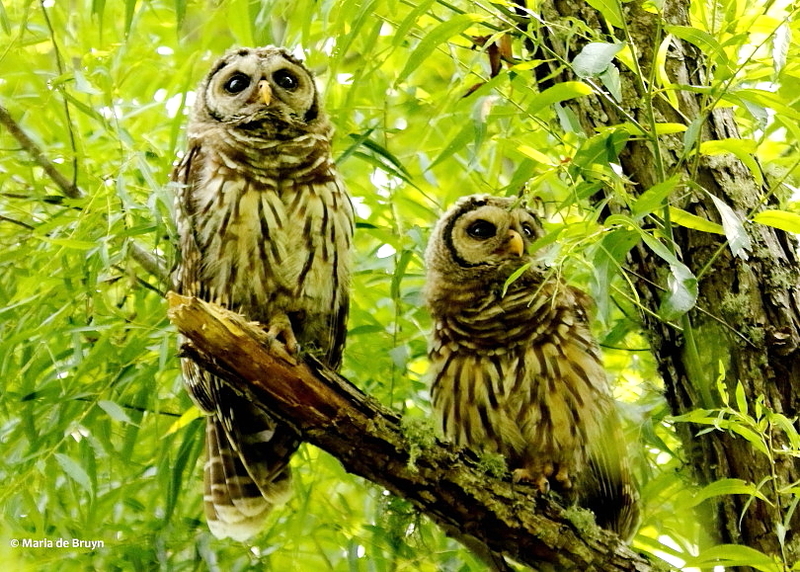 On several occasions over the next 6 weeks or so, I would hear the owlets making that keening call and staring upwards. 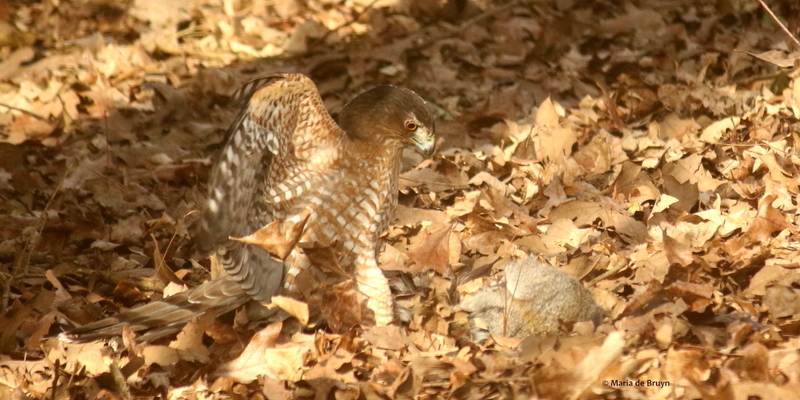 I figured the parents were nearby, but they were obviously just keeping an eye on their offspring and not feeding them (at least not when I was there). 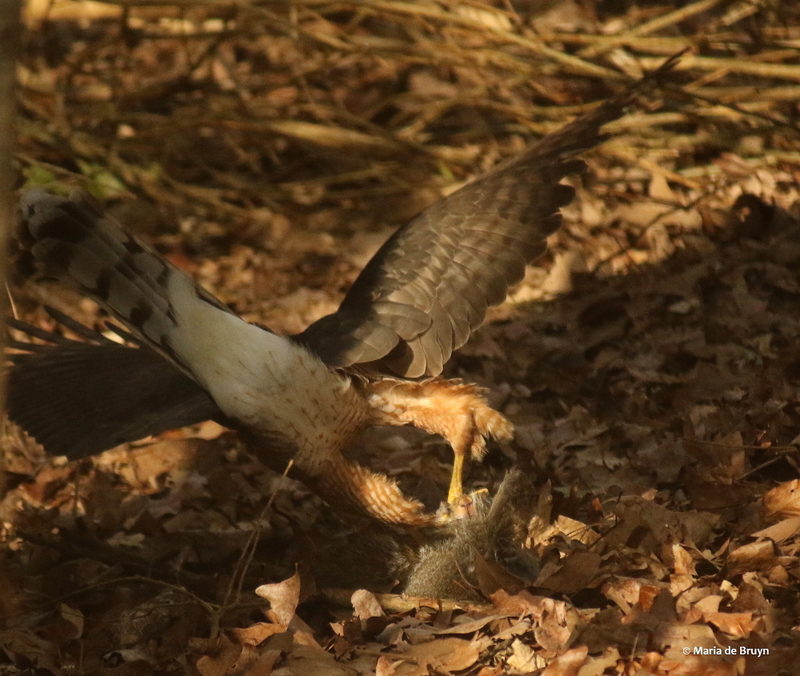 It was time for the young ones to learn how to get their own meals. 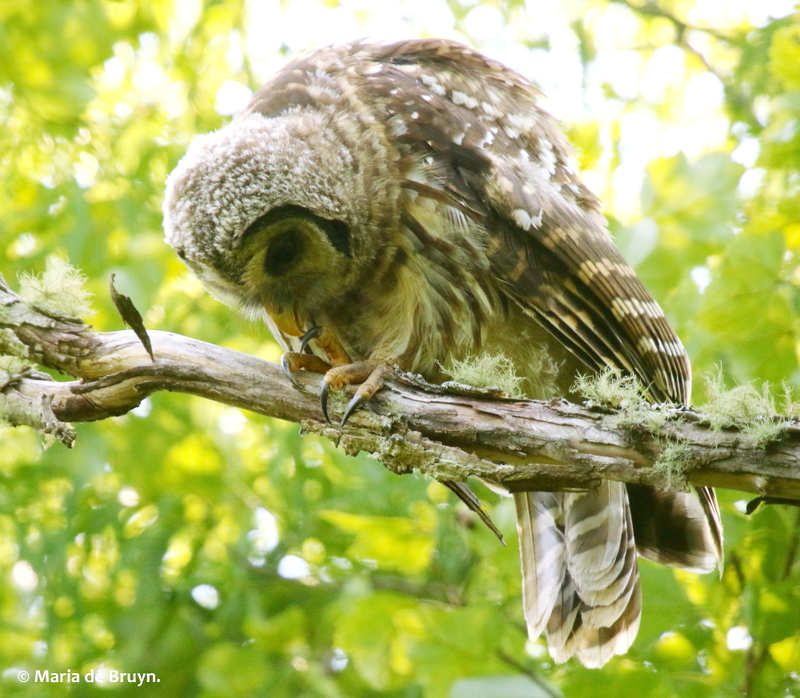 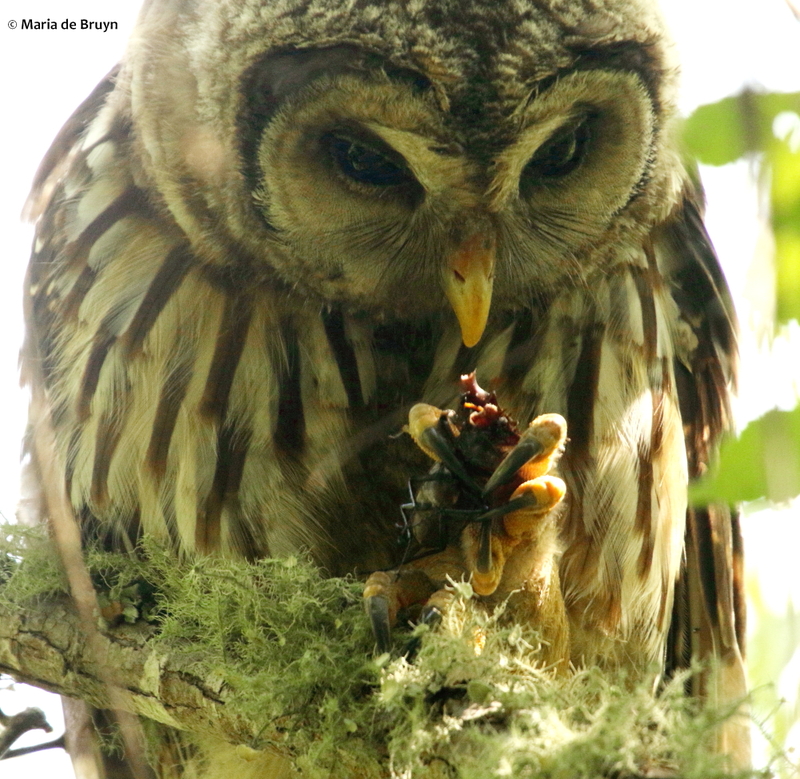 Although barred owls usually hunt at dawn and dusk, the young owls were busy looking for food during the day. 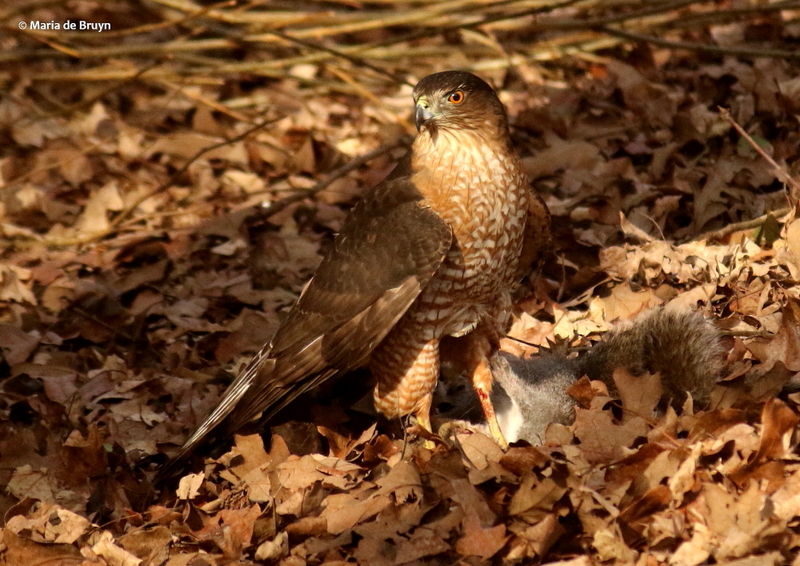 The mammals they eat include voles, mice, shrews, squirrels, rats, rabbits, bats, moles, opossums, mink, and weasels. 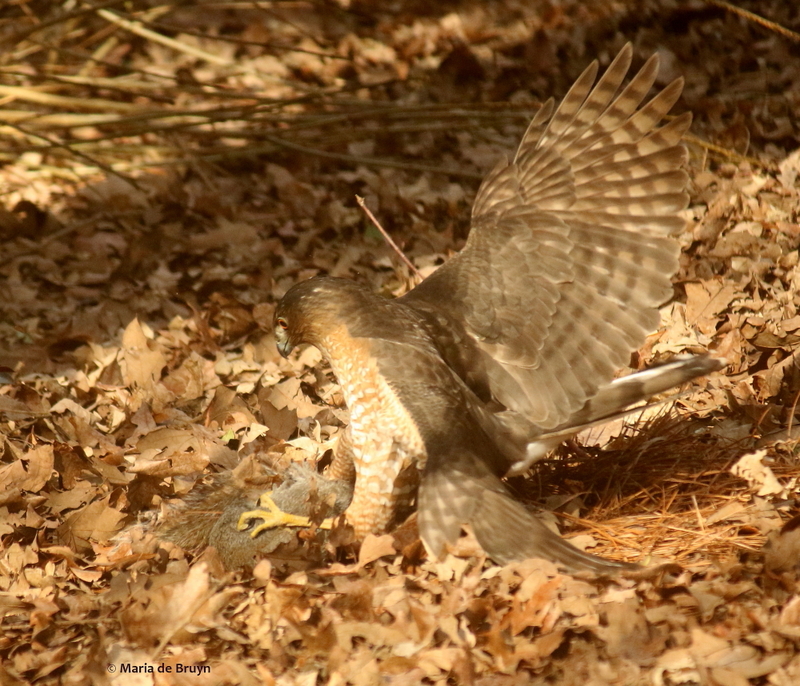 Birds are also a food source and their prey may include woodpeckers, grouse, quails, jays, icterids, doves, pigeons, cardinals, cedar waxwings and grackles. 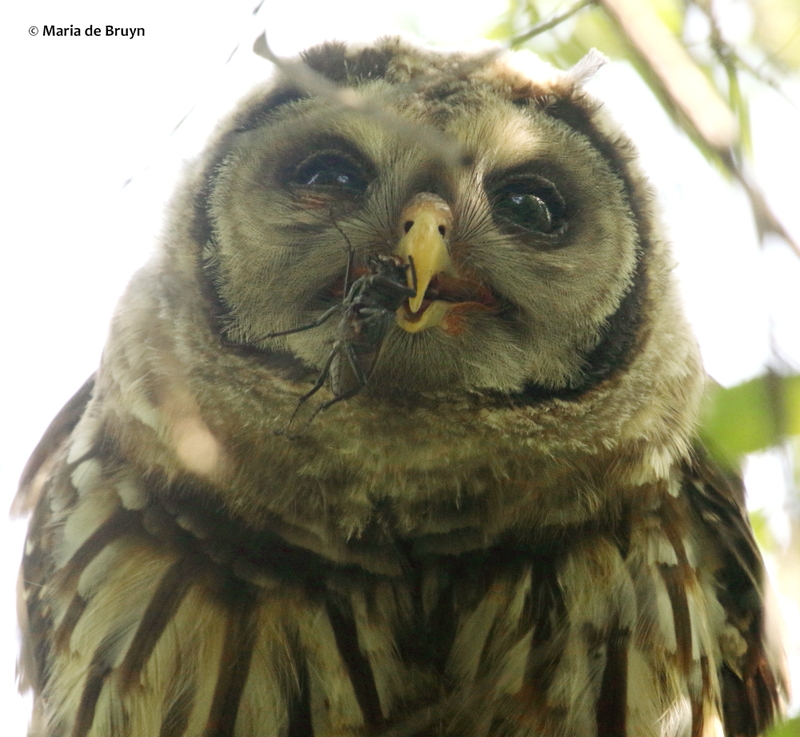 They also eat amphibians, reptiles and insects (e.g., snakes, slugs, lizards, frogs and toads, salamanders, crayfish, turtles, scorpions, beetles, crickets, grasshoppers) and it was the latter group of prey animals that I saw the owlets hunting. 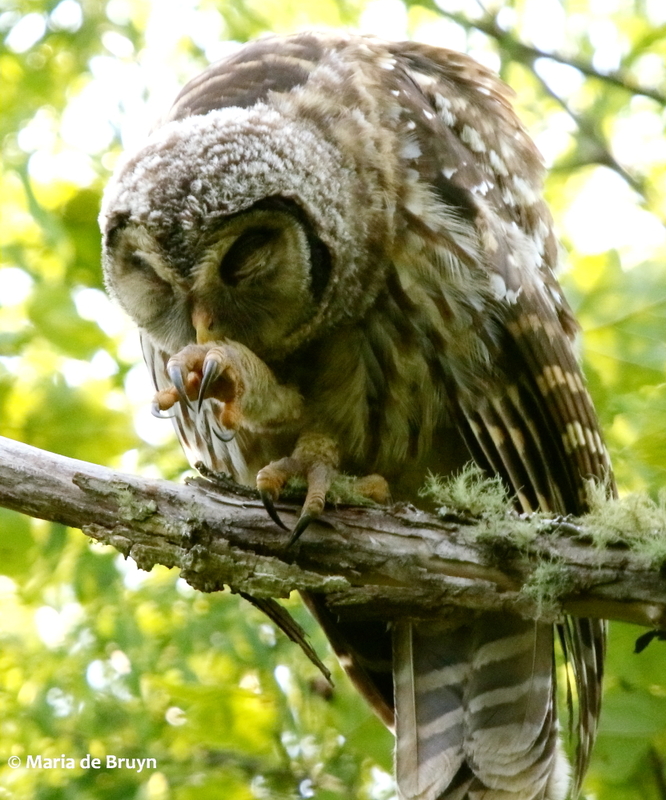 Here for example, it appears one young owl had caught a crayfish. 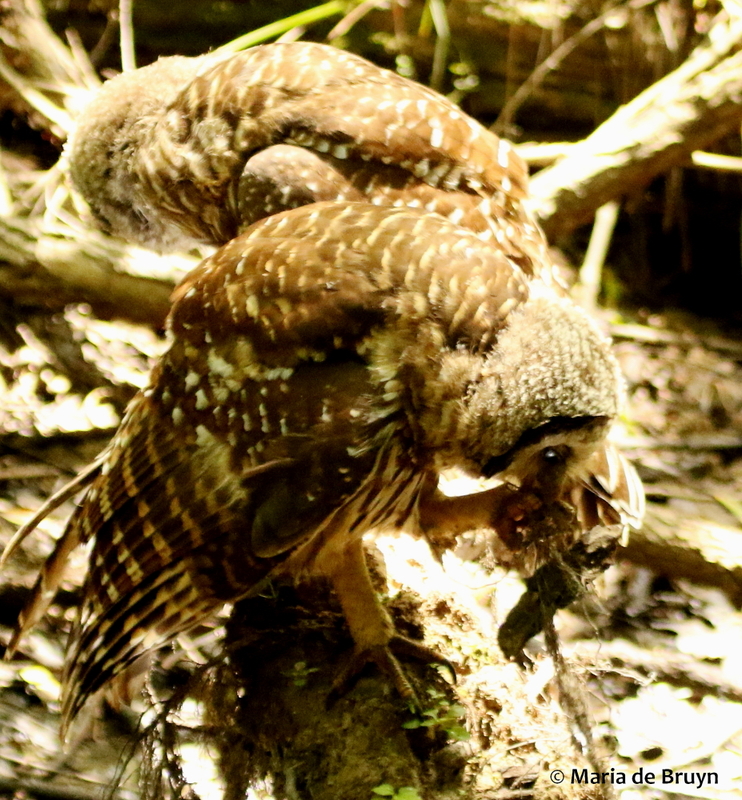 One day, one of the pair was grasping a twig in its beak; I’m not sure what it was doing but it seemed to have some purpose. 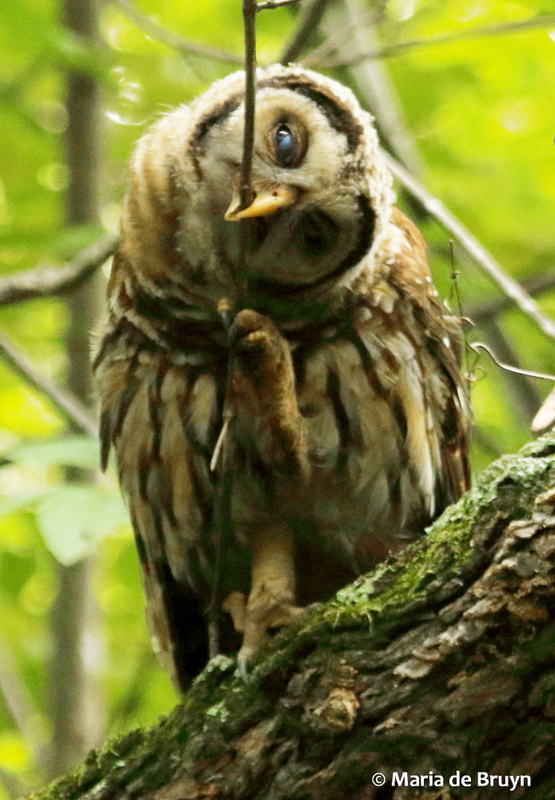 Perhaps it was testing how strong its beak was. 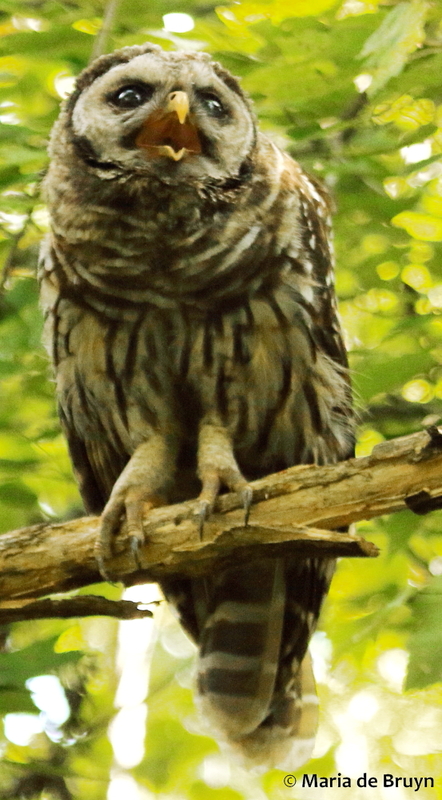 That a strong beak can be an asset became apparent on another occasion. 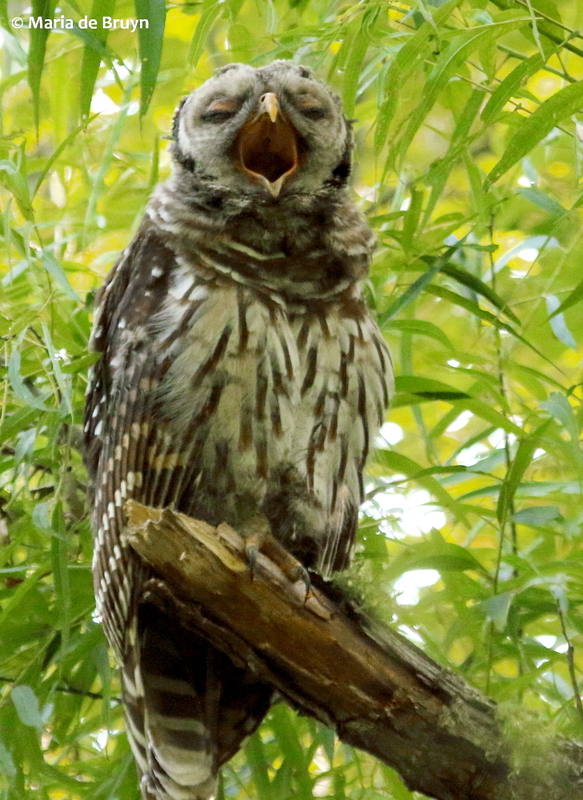 One of the juvenile owls suddenly flew from one tree on the other side of a water ditch to one above my head. 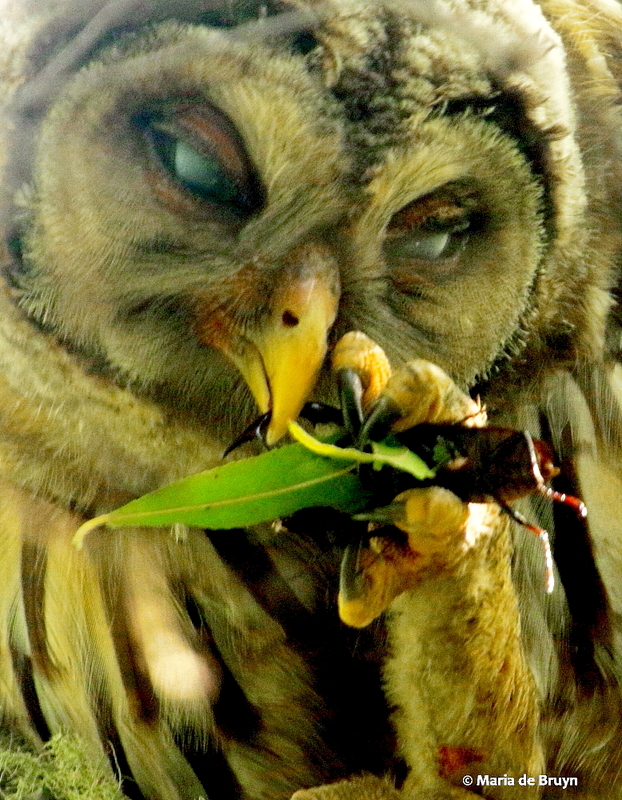 There was much rustling of branches and leaves and when I got into a spot where I could see the bird, it became obvious s/he had caught the largest stag beetle I had ever seen at Mason Farm Biological Reserve. 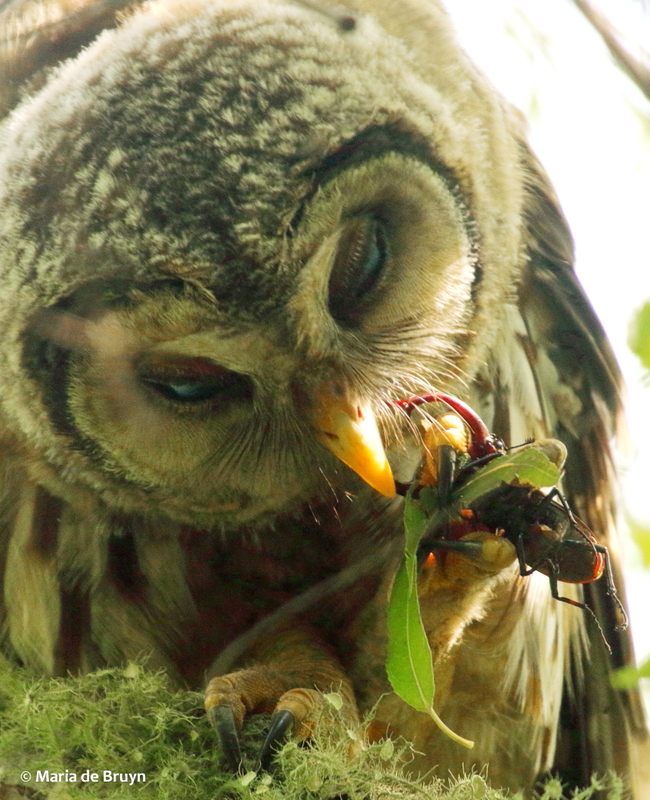 It appears that the giant stag beetle (Lucanus elaphus) drinks tree sap, which must have been what it was doing when the owlet got hold of it. 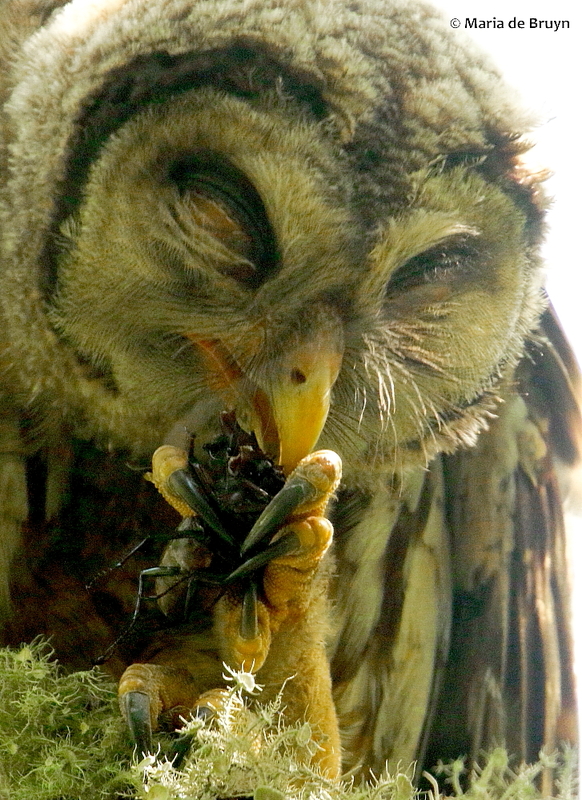 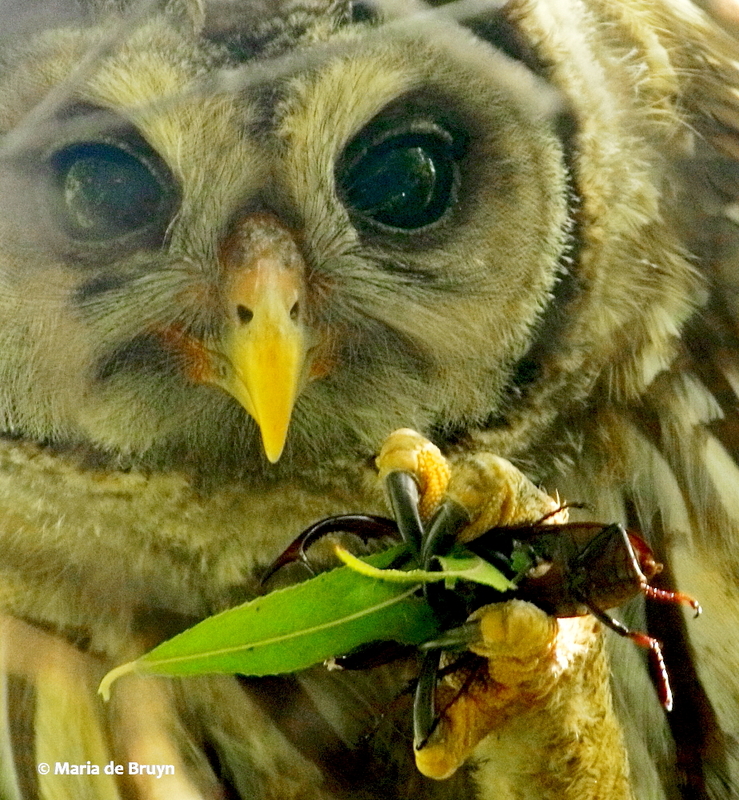 The problem for the owl was how to eat the beetle when those large pincers were in the way. 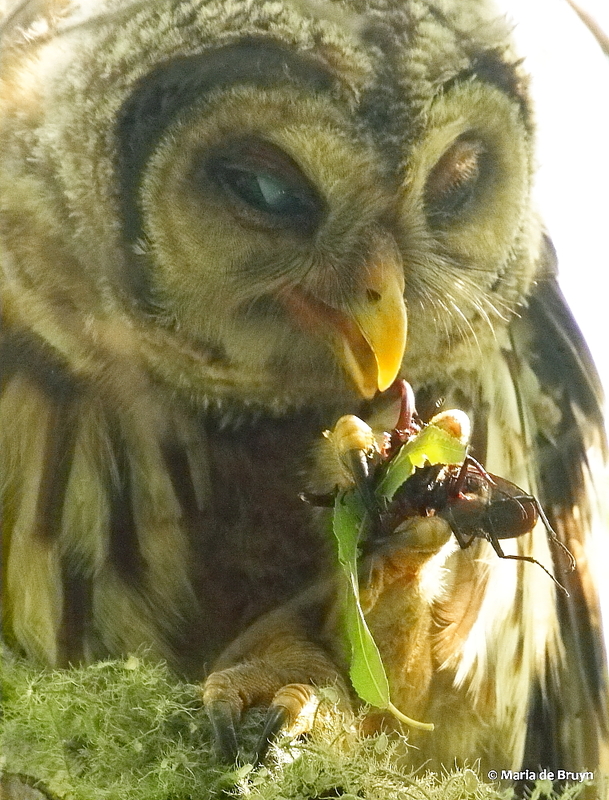 The owl would try to grab hold of a pincer but lose its grip; s/he would turn the beetle around but was having a very difficult time getting those defensive appendages off. 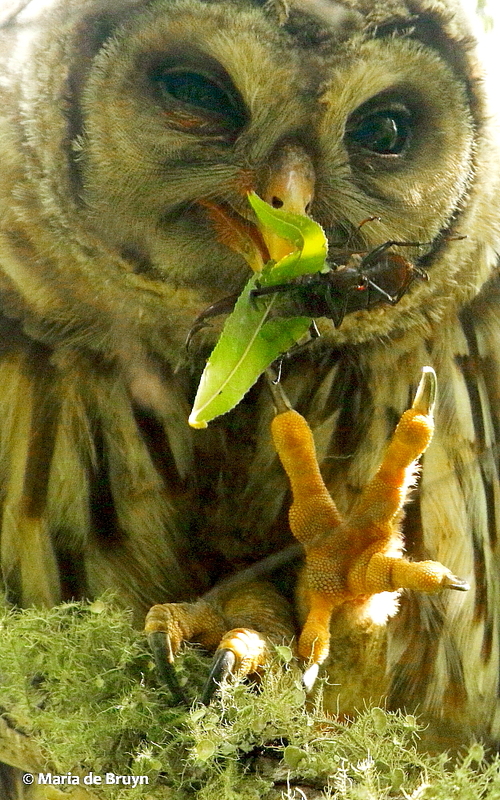 This went on for quite a long time, which made me feel a bit sorry for the beetle. 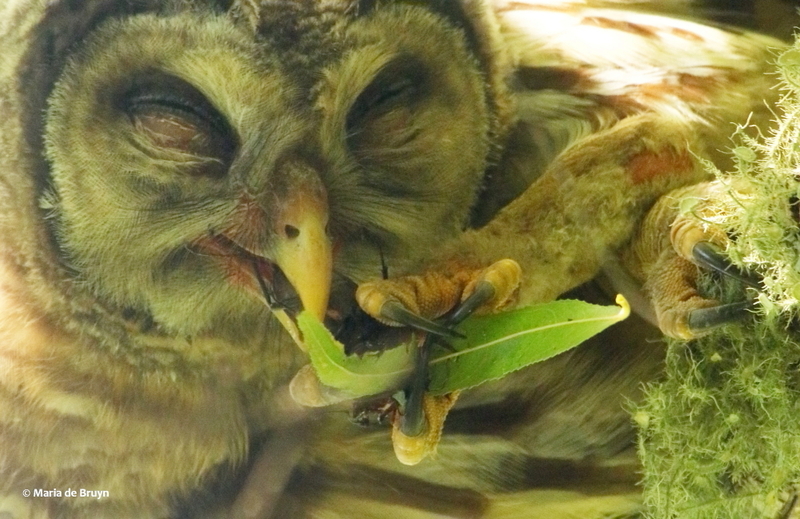 Finally, the owl had success and was able to settle in for a crunchy meal. 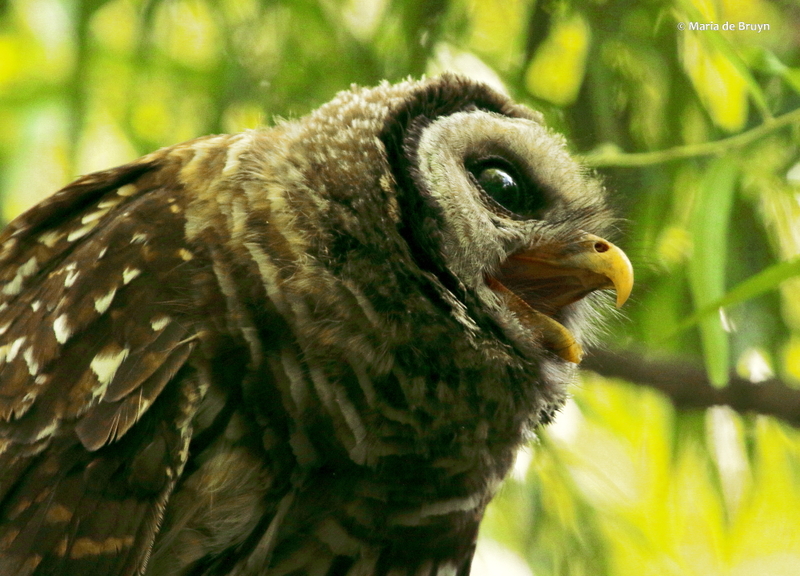 They expel the indigestible parts of their prey in owl pellets that they cough up regularly. 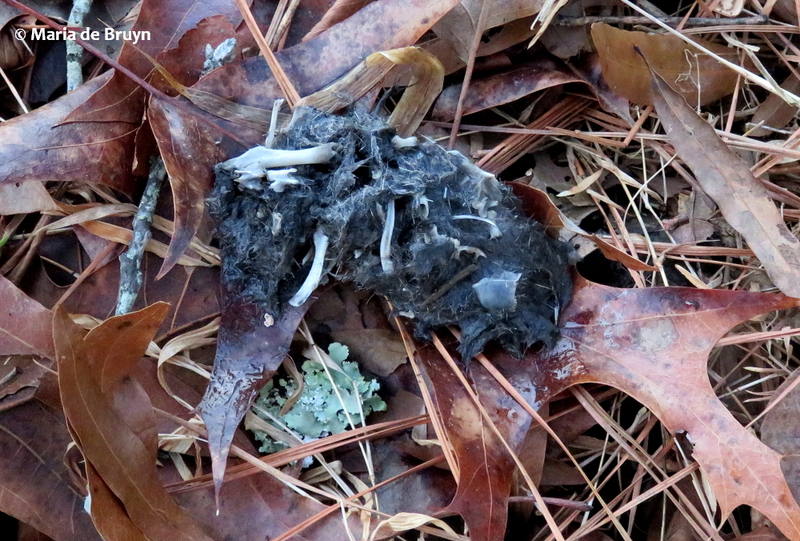 Here you see the contents of one a friend found under a favorite perching branch at the reserve. 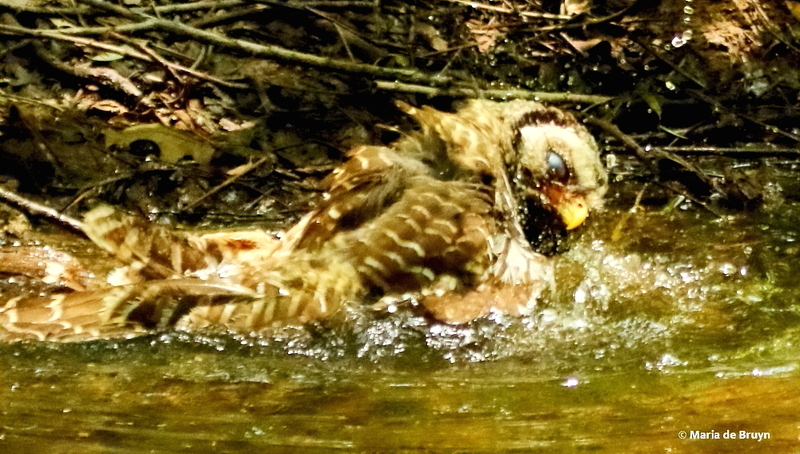 Another day I saw one owlet suddenly fixate on the water ditch.It turned out that quite a large rat snake (Elaphe obsolete; Pantherophis alleghaniensis) was swimming by. 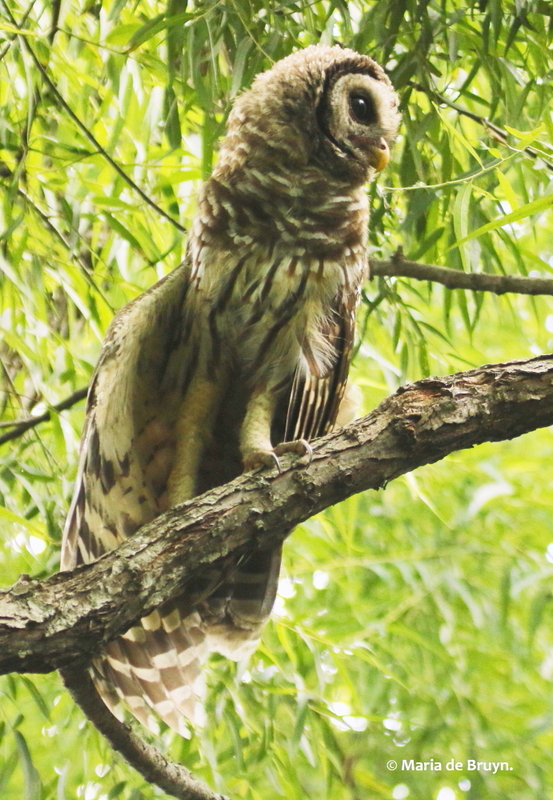 The owl watched it carefully as it climbed out of the ditch and eventually crossed the adjacent walking path, never making a move to tackle the reptile. 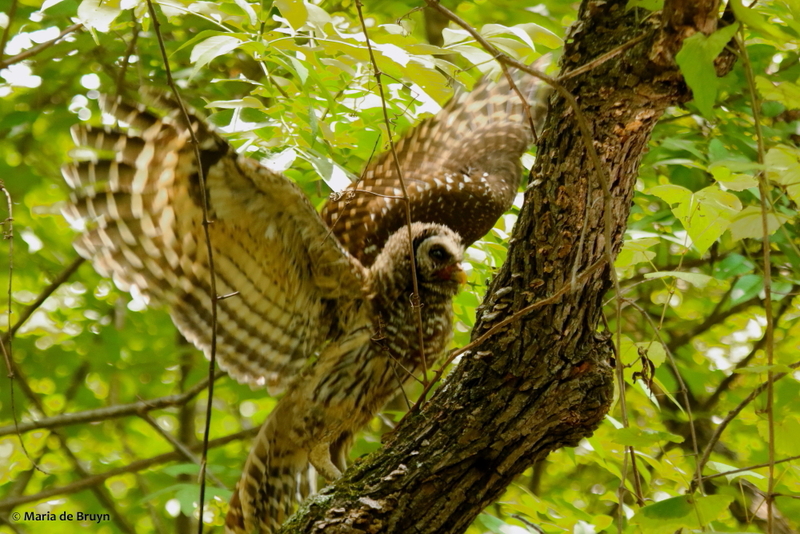 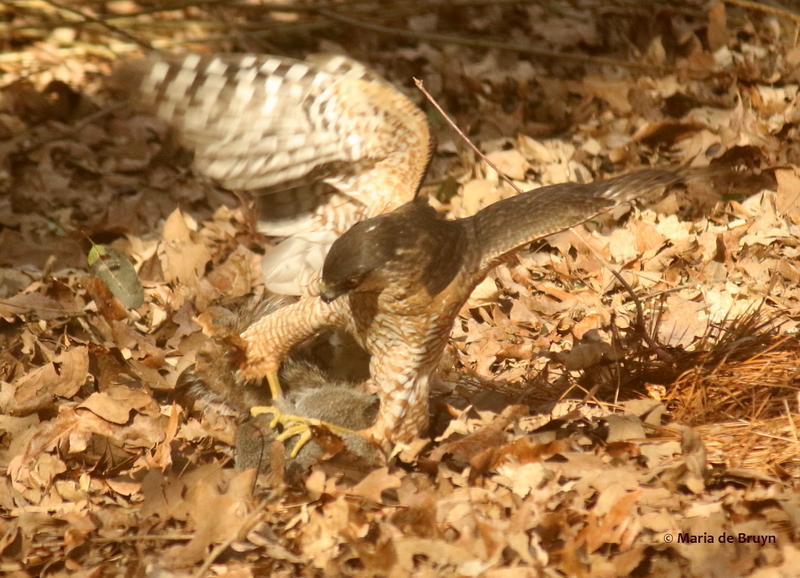 I had remarked on this encounter to the reserve’s land manager, who said it was probably a smart move on the owlet’s part, since the snake was large enough that it could have wrapped around the owl’s head and choked it. 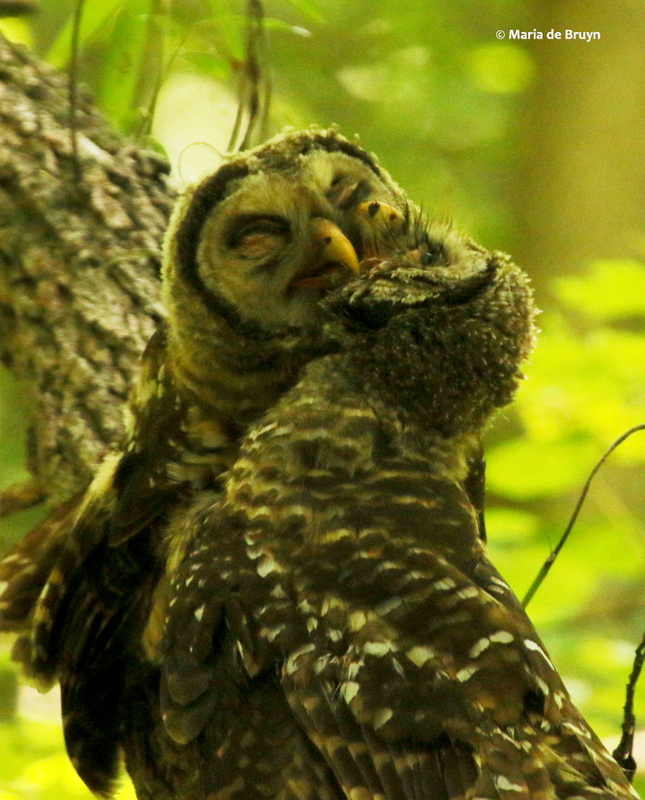 The young owls seemed to have learned a lot about life as a predator as they grew older. 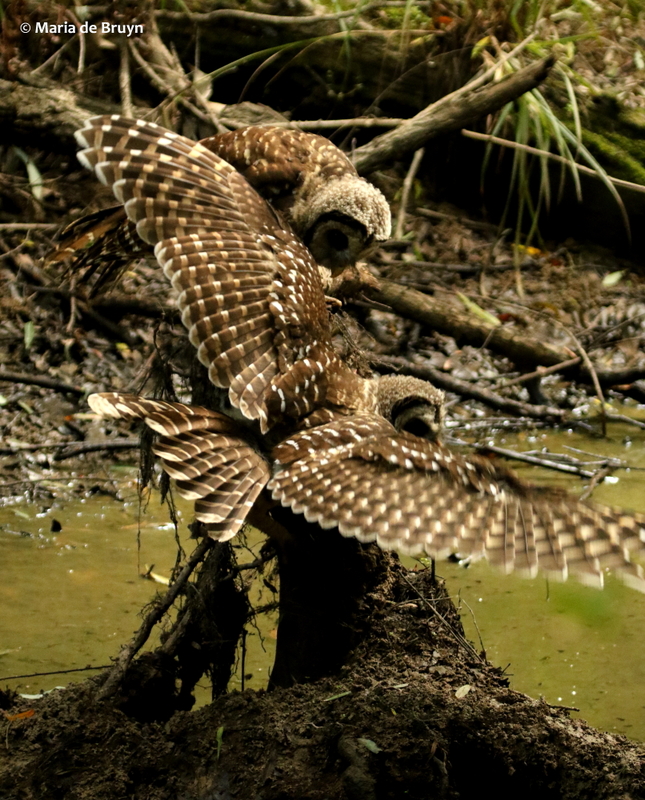 It was fascinating watching them explore their world. 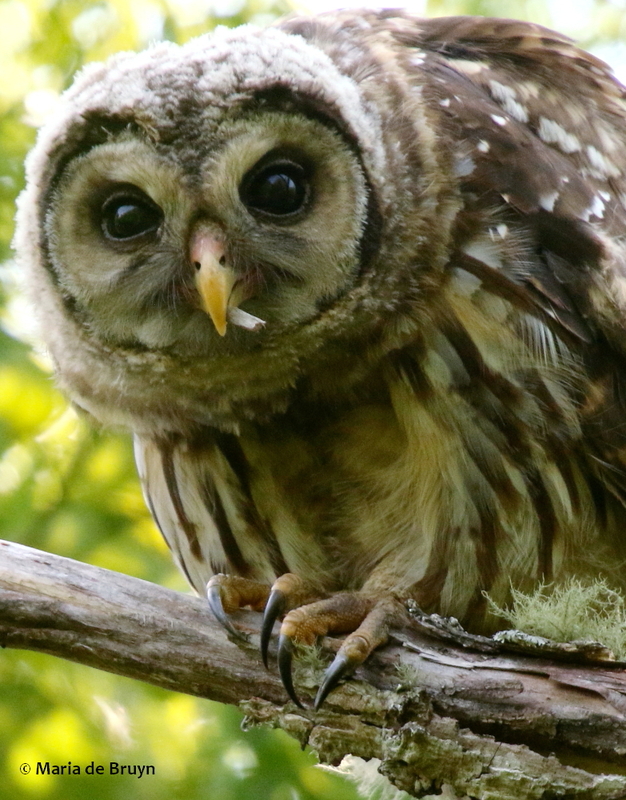 Next up: how the owlets cared for themselves. 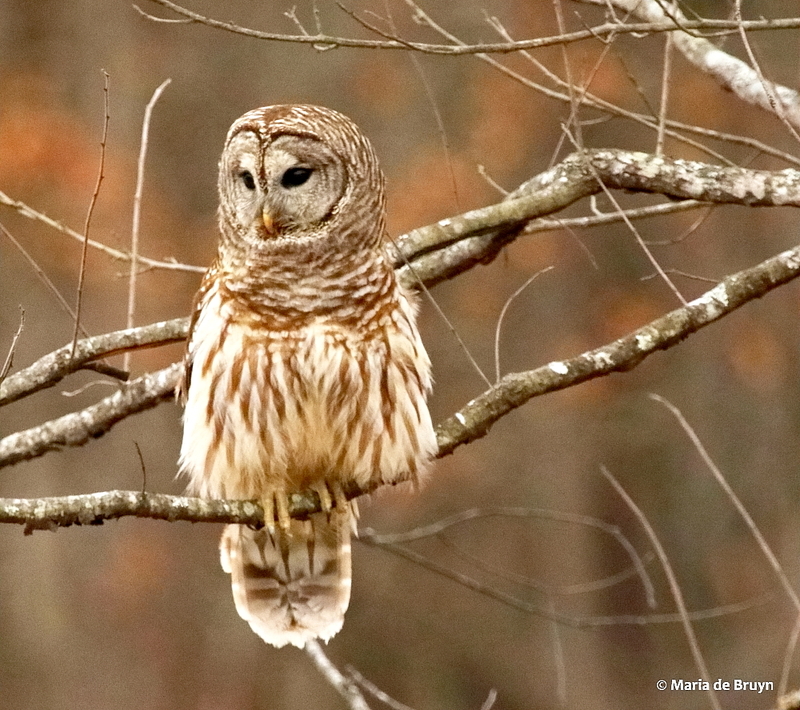 The end of winter and start of spring is a good time to look for some of the birds that you don’t see so often. 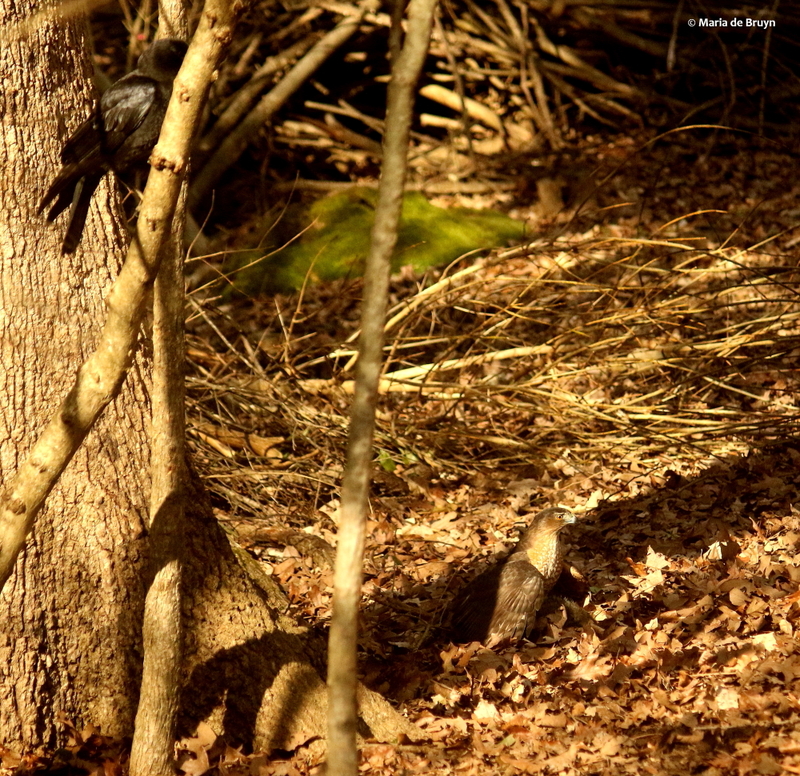 They are not hidden by foliage and may come out more to hunt for a meal as they prepare to cope with the rigors of upcoming parenthood. 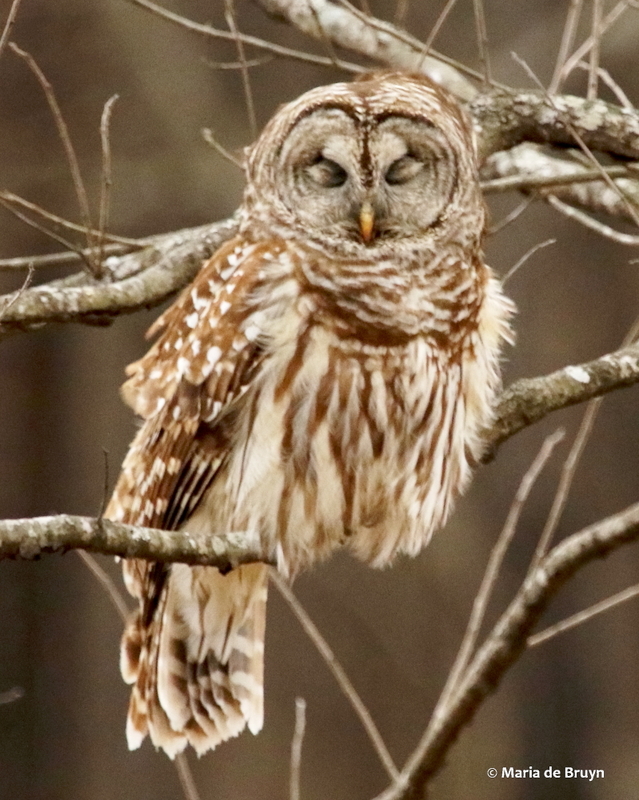 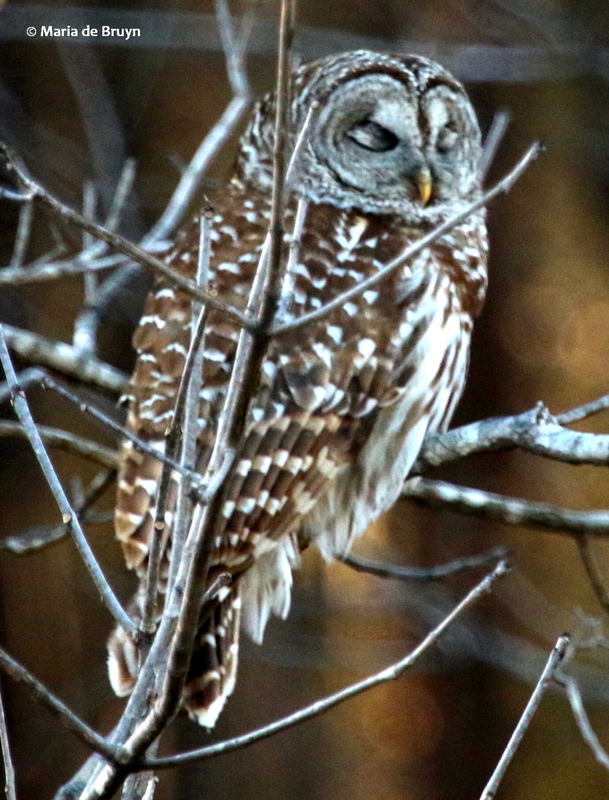 That has proved to be a boon for me during visits to Mason Farm Biological Reserve where there are several pairs of barred owls (Strix varia) in residence. 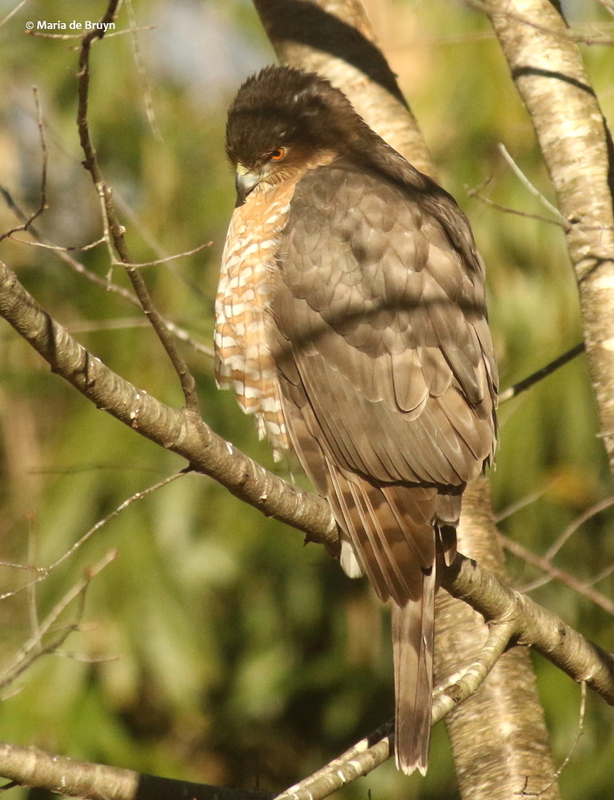 While these birds usually hunt at night, they have recently been seen out and about much more often in the daytime, perhaps getting ready for nesting and brooding in March and April. 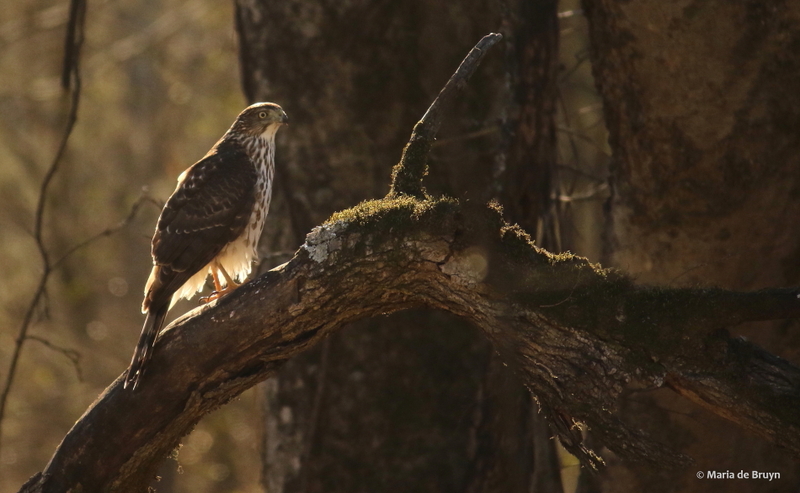 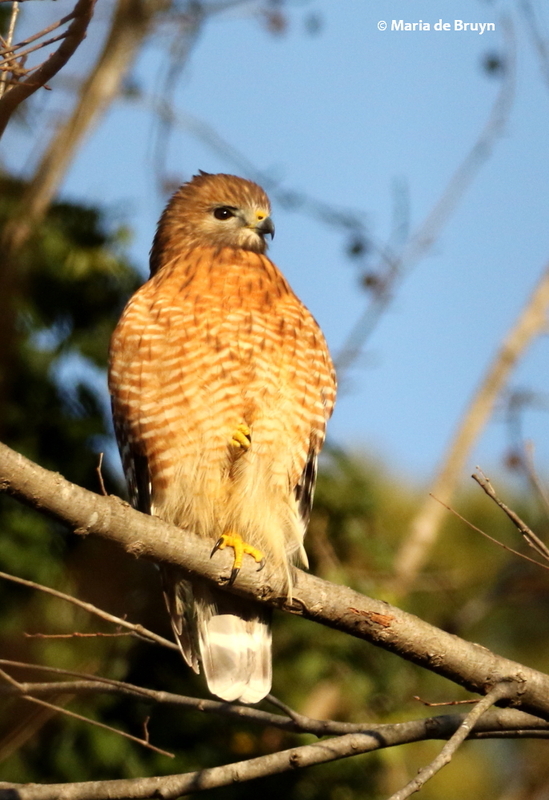 These beautiful raptors sit quite still and often make no sound at all as they turn their heads scanning the ground or a creek nearby for small rodents, crayfish, fish, insects, amphibians and reptiles. 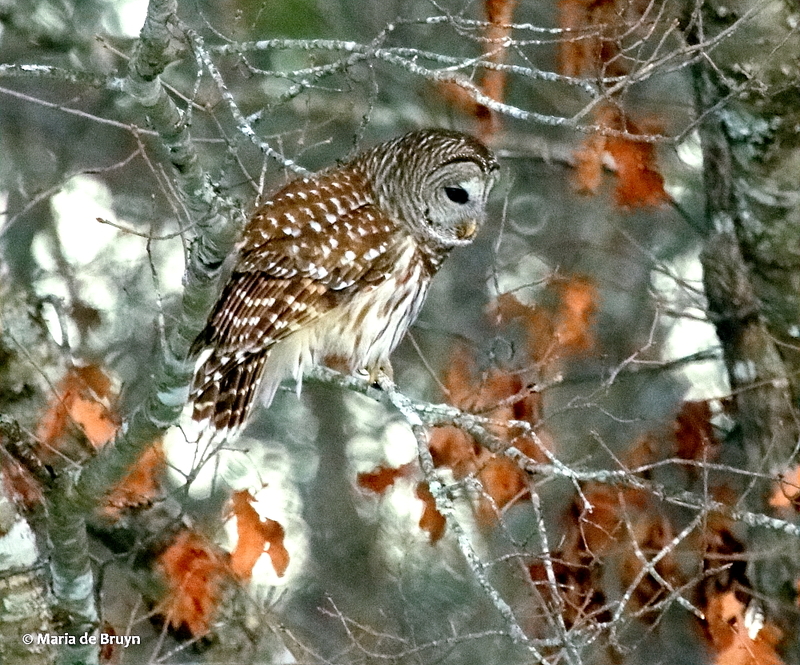 Their brown and white mottled feathers are a perfect camouflage to help them blend in with the bare gray and brown tree trunks and branches of winter. 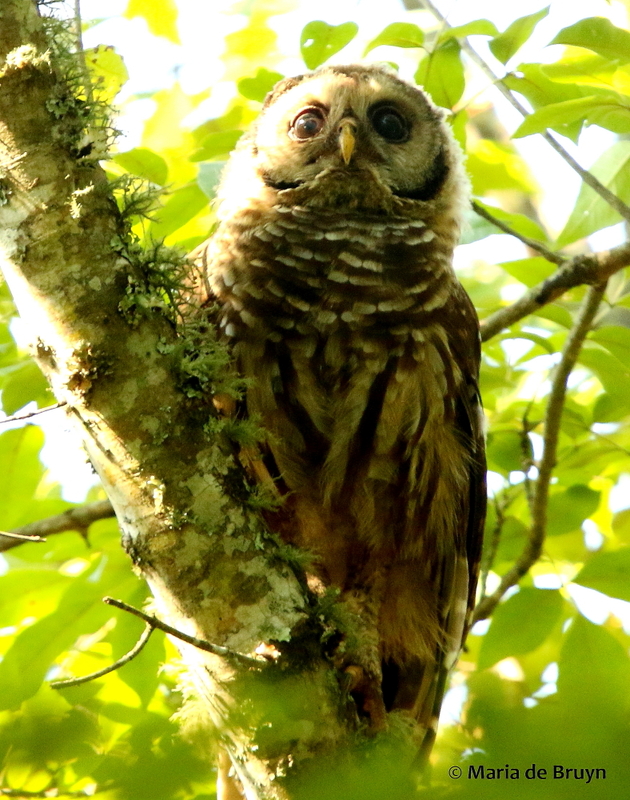 To spot them, you learn to scan trees in the distance looking for a “lump” which your binoculars or long camera lens can then help distinguish as an owl. 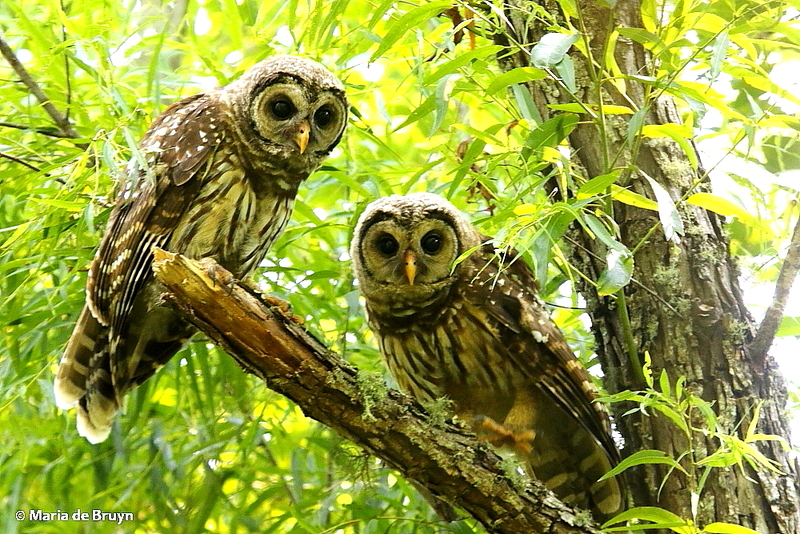 These owls tend to stay in one area; a study of 158 banded birds showed that none of them had ventured further away than 6 miles from the spot where they were first seen. 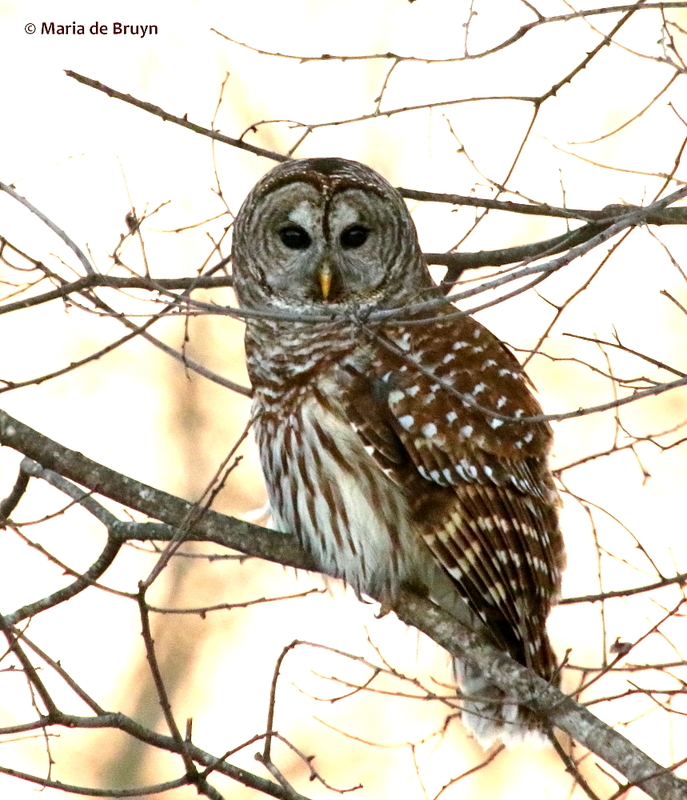 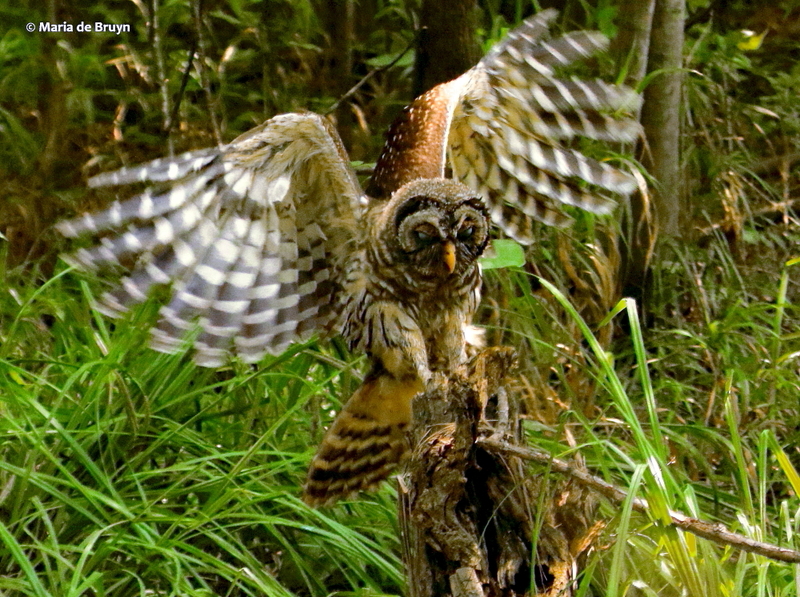 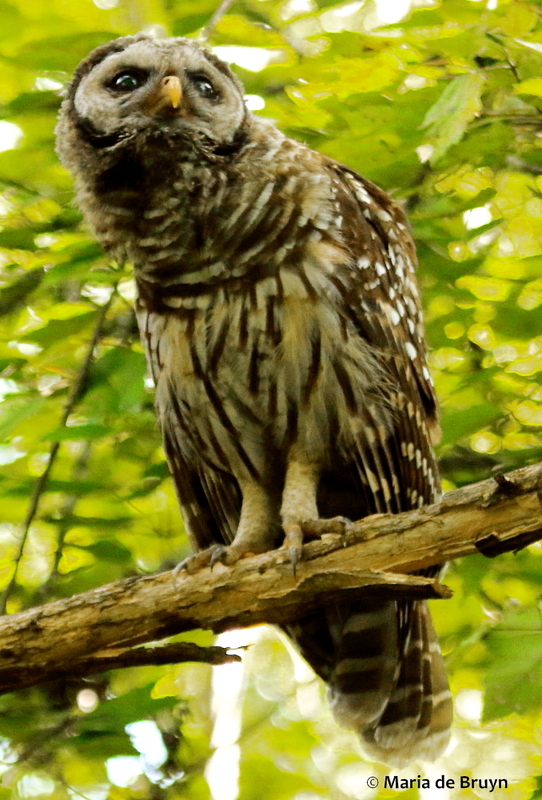 At Mason Farm, we tend to hear the owls in specific areas – along a creek, near a couple of open fields and near a bog. 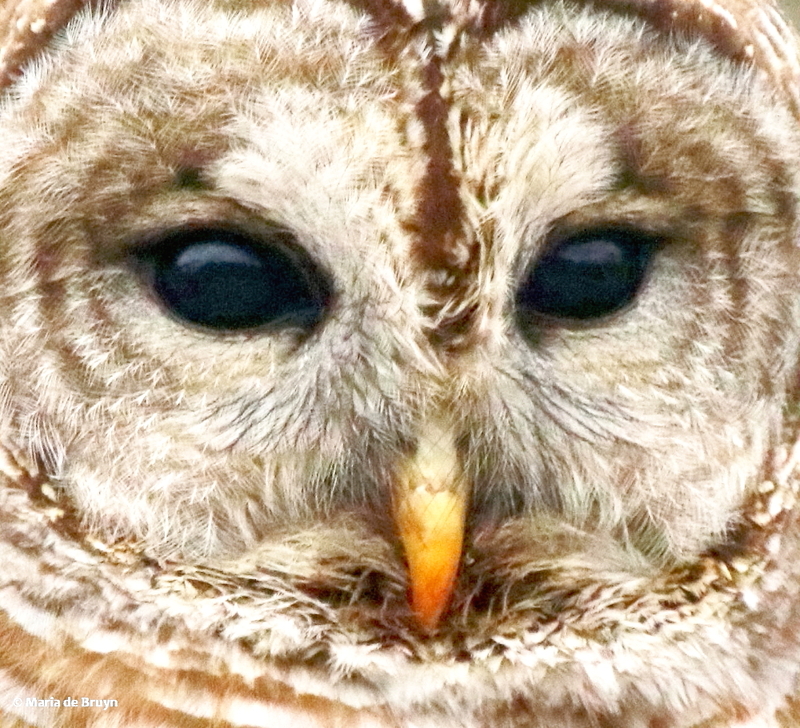 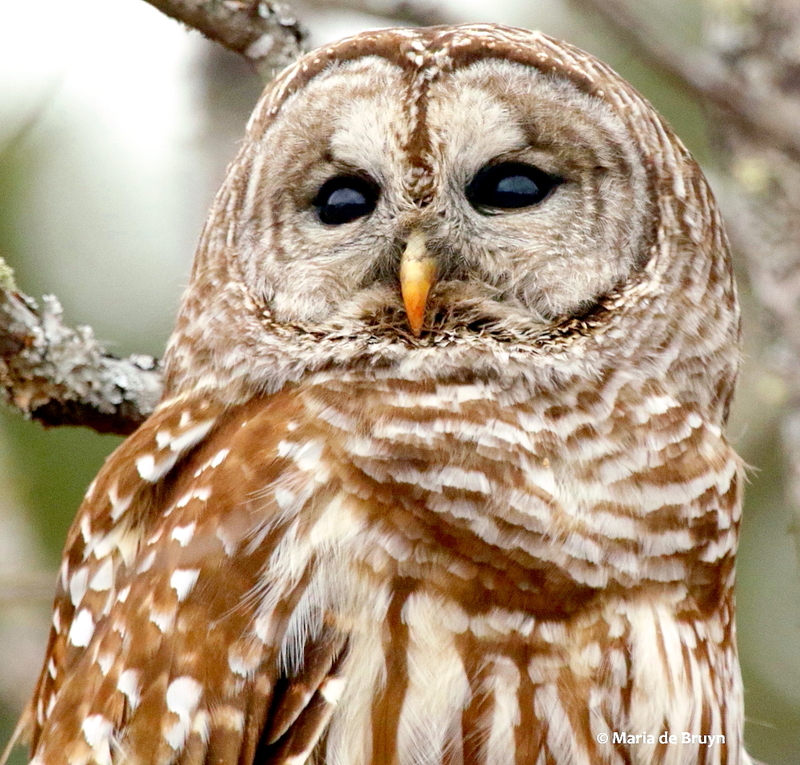 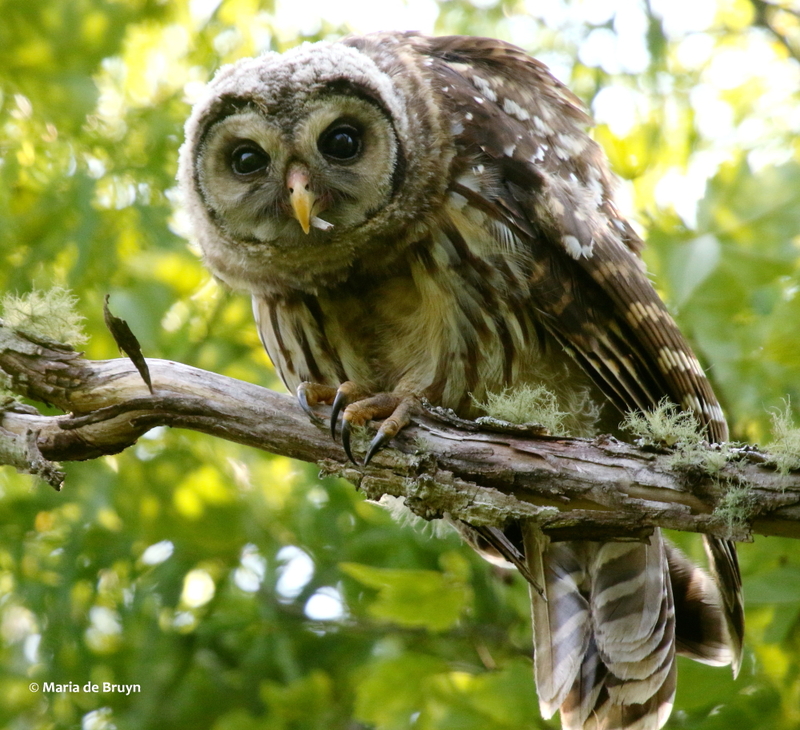 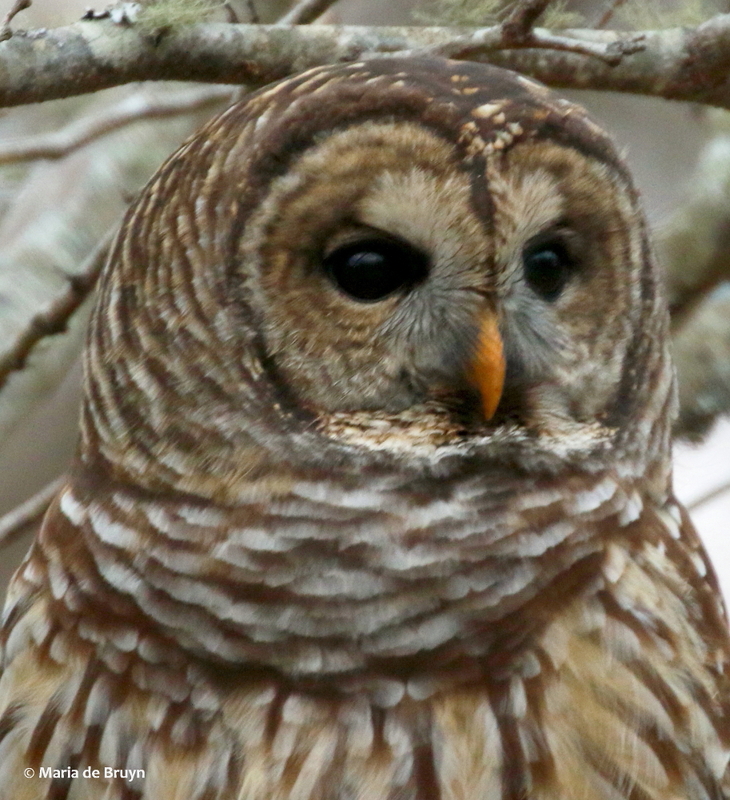 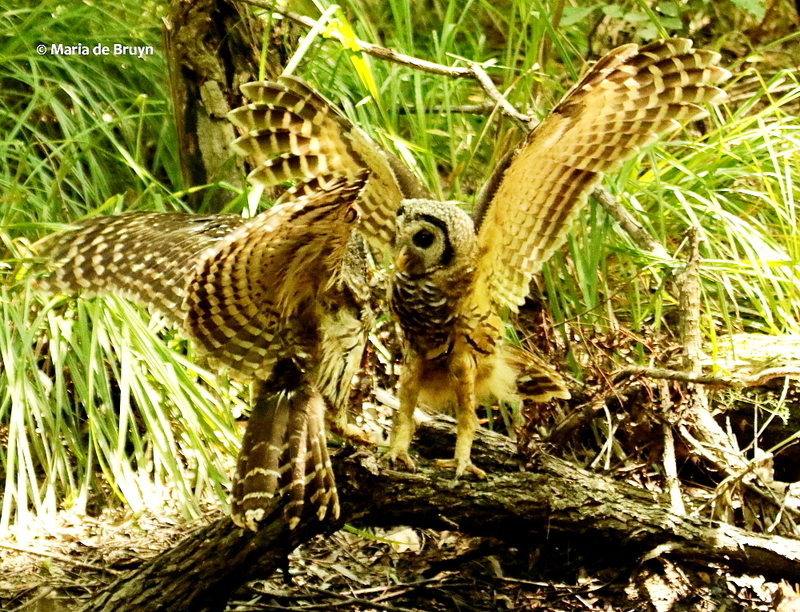 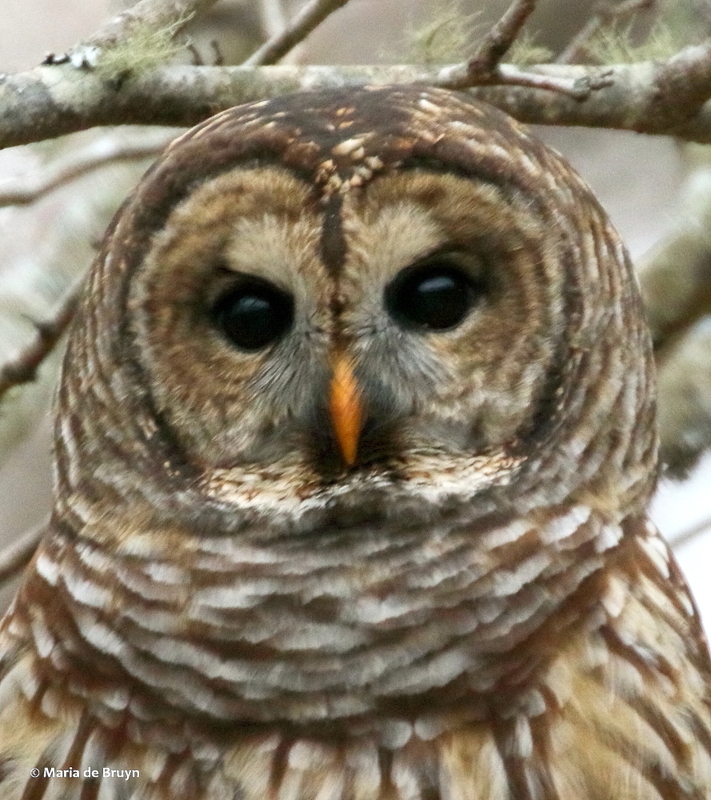 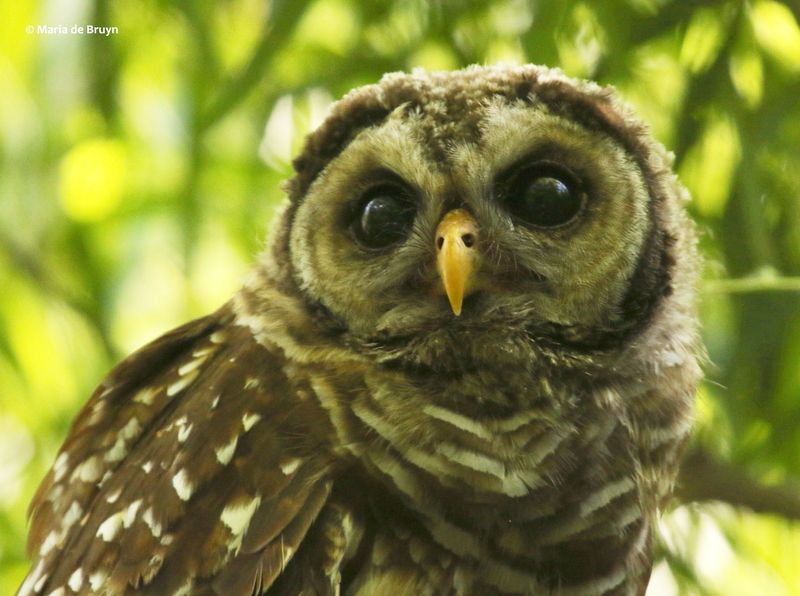 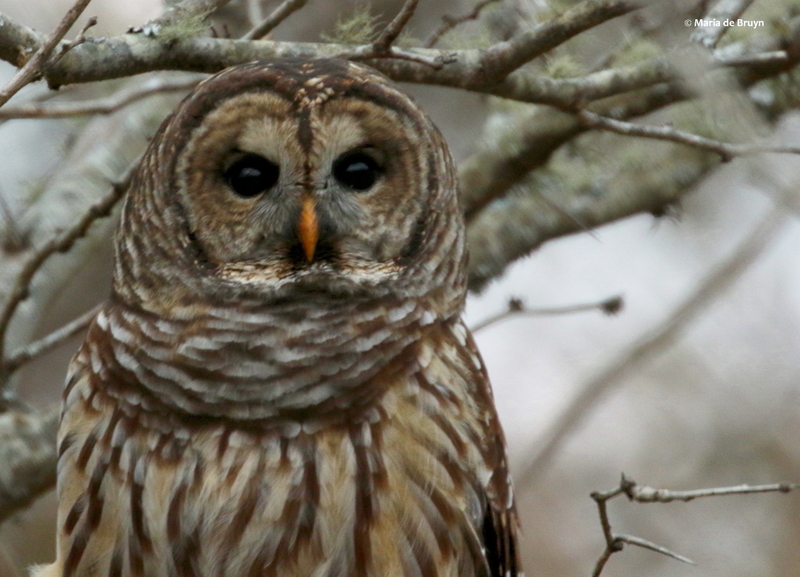 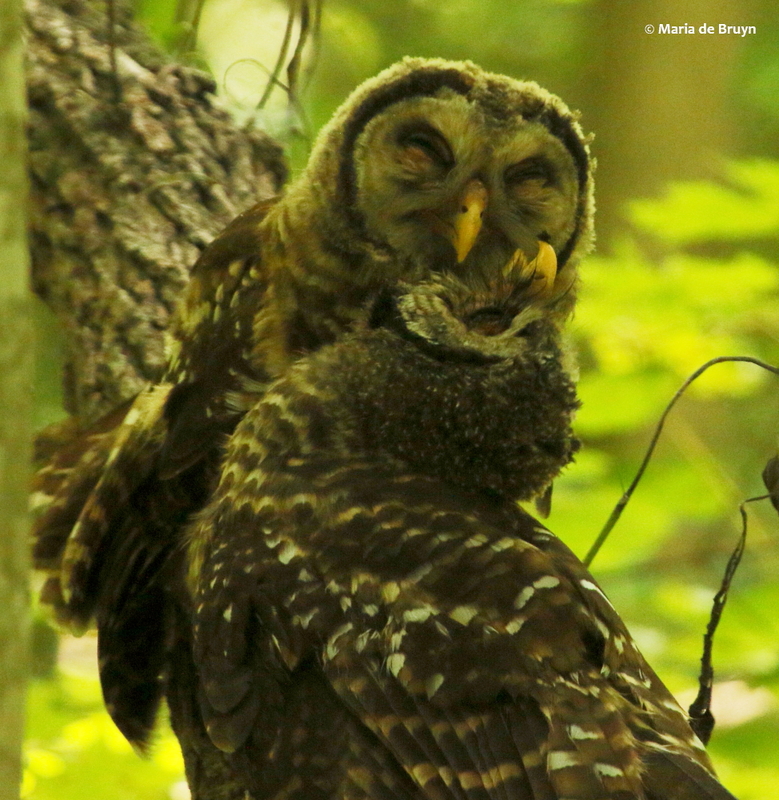 These are likely different pairs who can live there for decades – the oldest known barred owl was 24 years old. 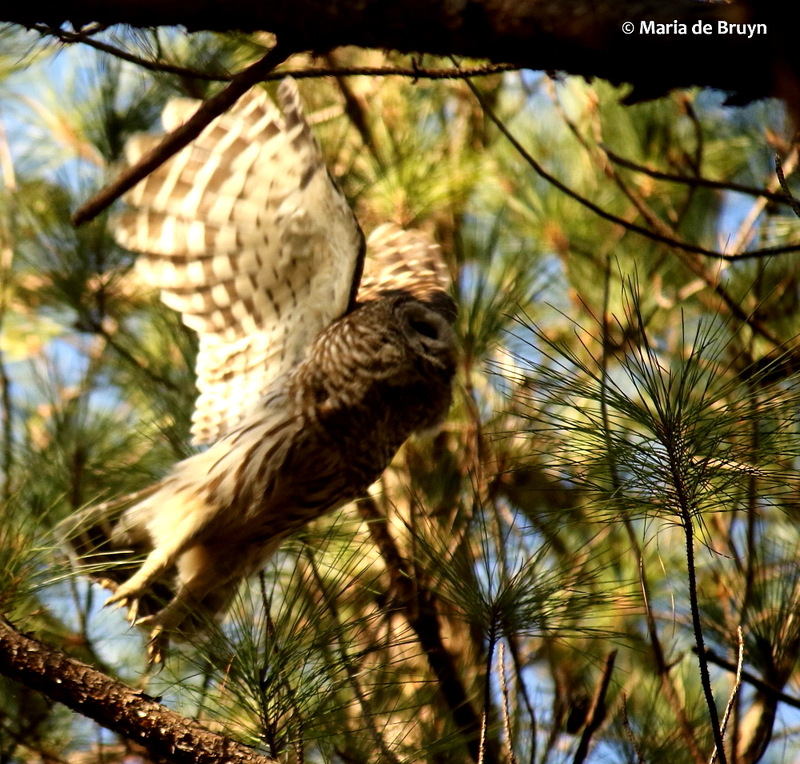 After hearing that friend Mary had been seeing one particular owl daily, I began going there more often to catch a glimpse of him/her. 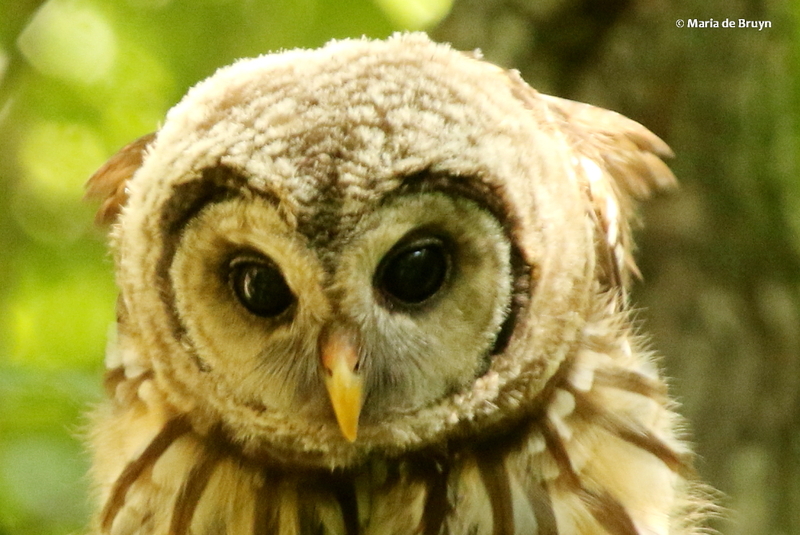 I nicknamed the bird Ollie – short for Oliver or Olivia. 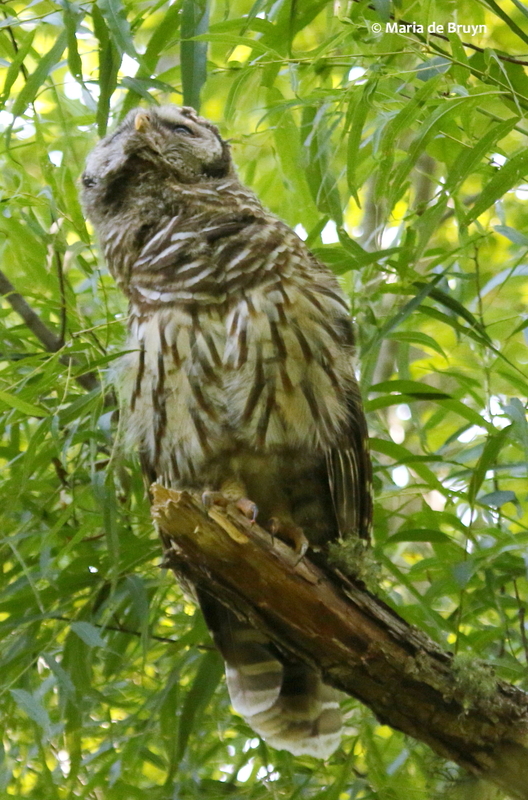 It turned out that I was fortunate enough to see both Ollies; the pair has become fairly tolerant of people nearby, sometimes perching in trees right next to the walking path. 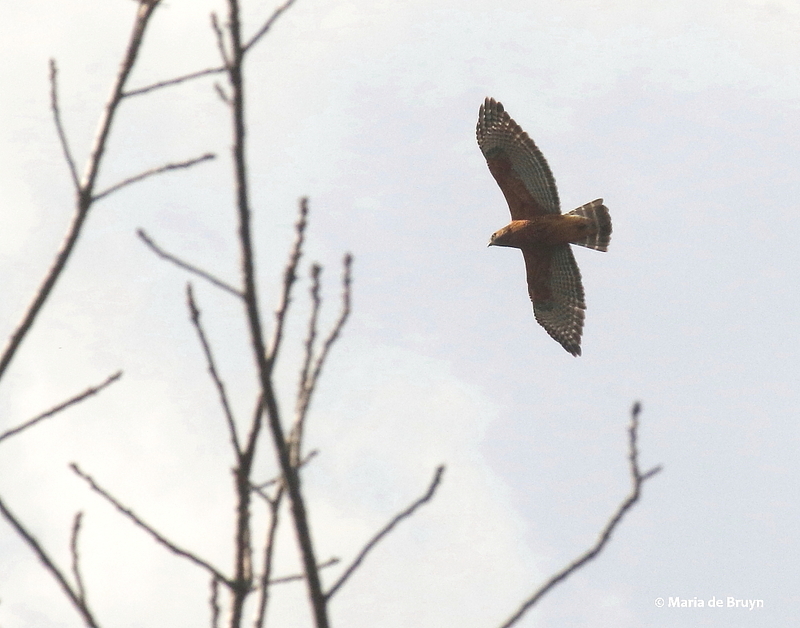 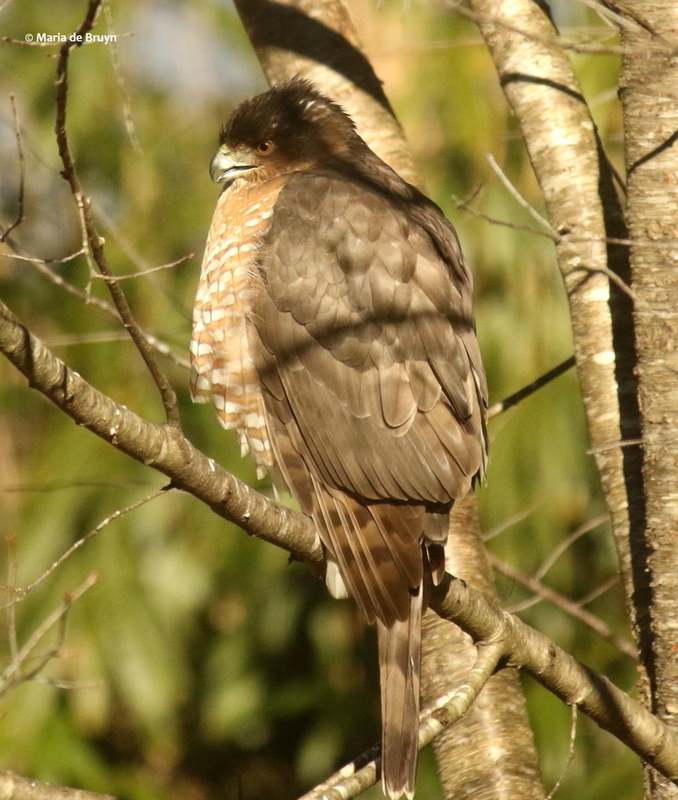 One mid-afternoon, I was searching the fields for Ollie, noting some of the other birds who were easier to spot because of their movement, like the red-bellied woodpeckers and song sparrows. 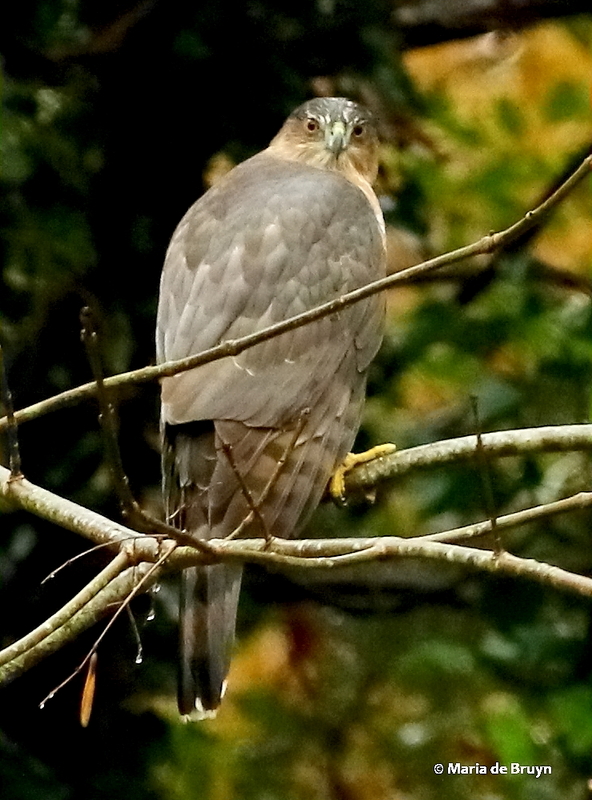 I was looking into the mid- and long-distance and then glanced up at a small tree next to the path – there was Ollie staring back at me! 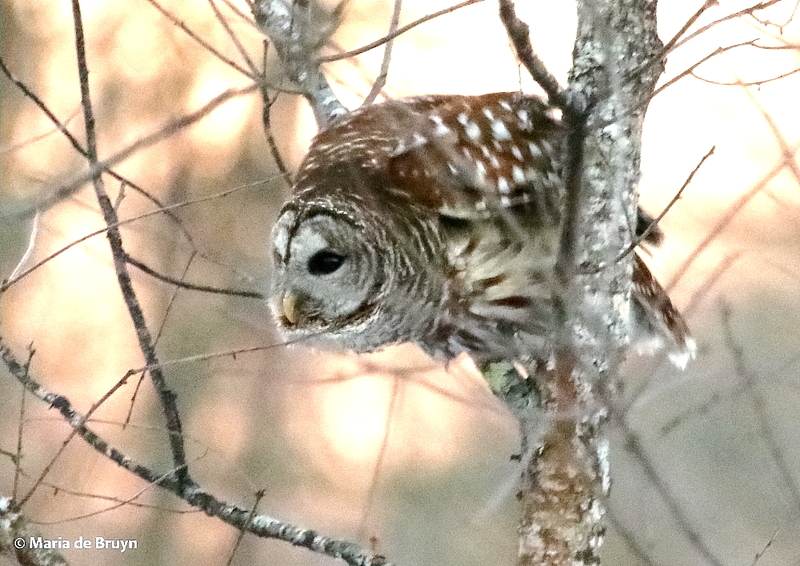 I had never been within about 5 feet of a wild barred owl before and was able to see him/her really well – what a beautiful bird! 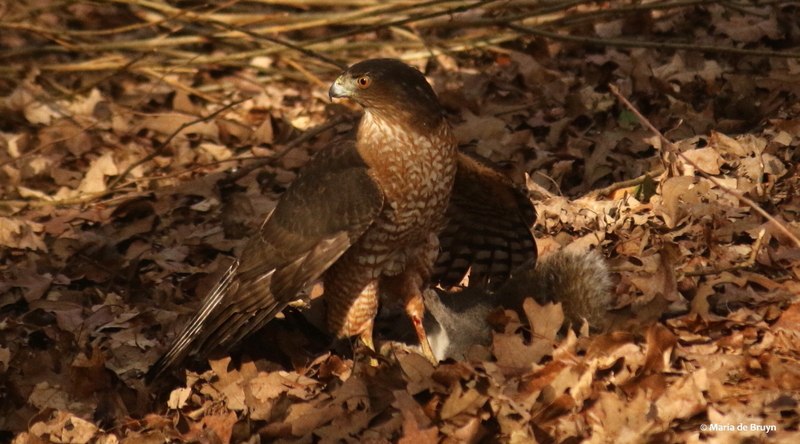 To get some photos, I actually had to back up as I had a long-distance lens on the camera. 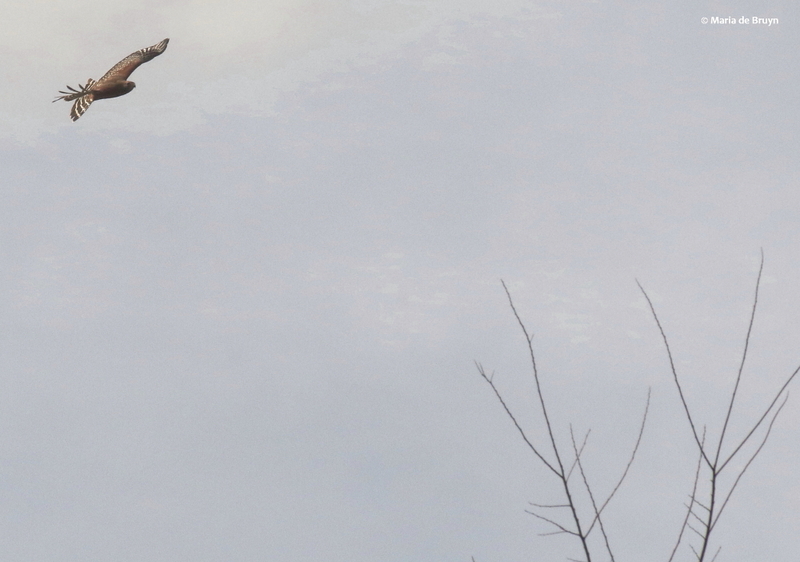 Some runners came by and saw that I was focused on something, but they never looked up to notice that they were passing couple feet underneath this large raptor. 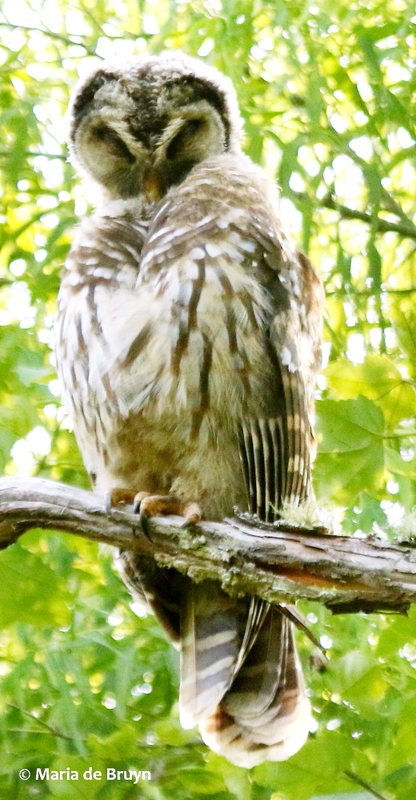 Ollie just watched silently as they ran by and then returned to scanning the ground for prey. 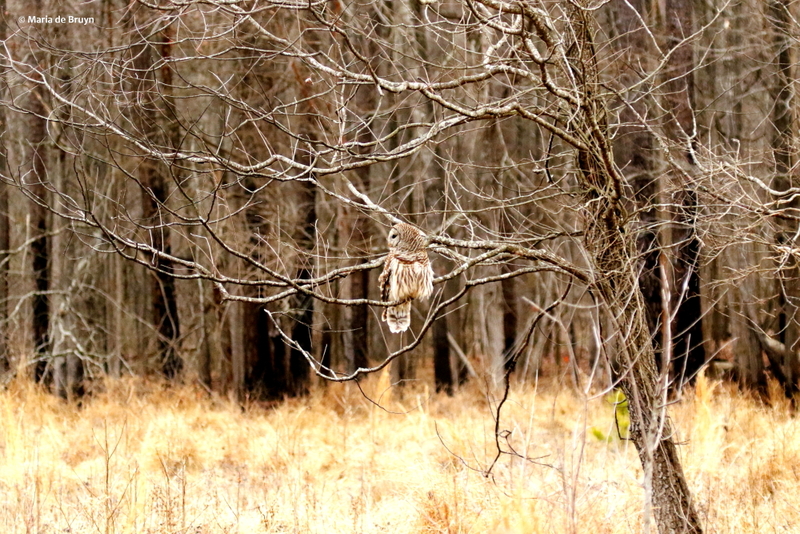 Another day, Mary and I were following an owl from one field to the next. 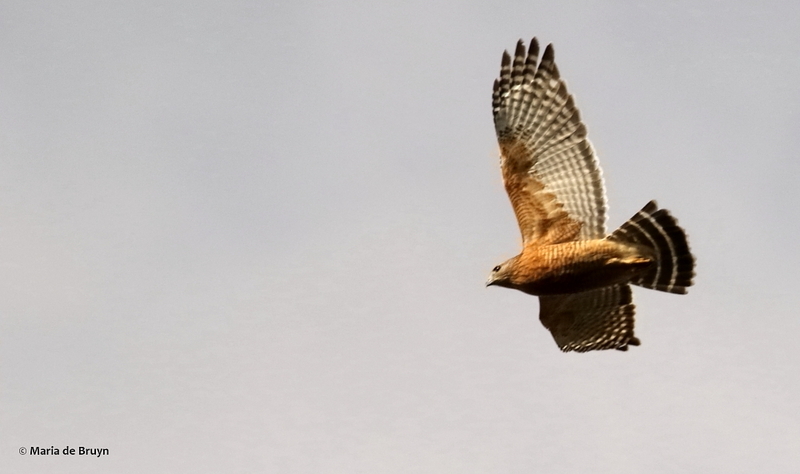 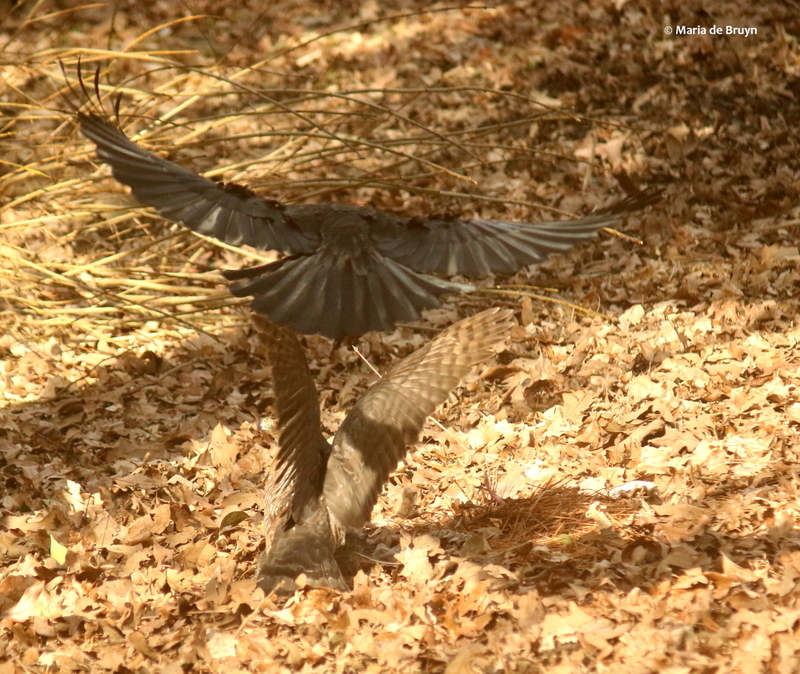 The hunting pattern appears to be: perch in a tree and look intently at the ground around for 10-20 minutes or longer, fly some 20 or more feet away to scan another patch. 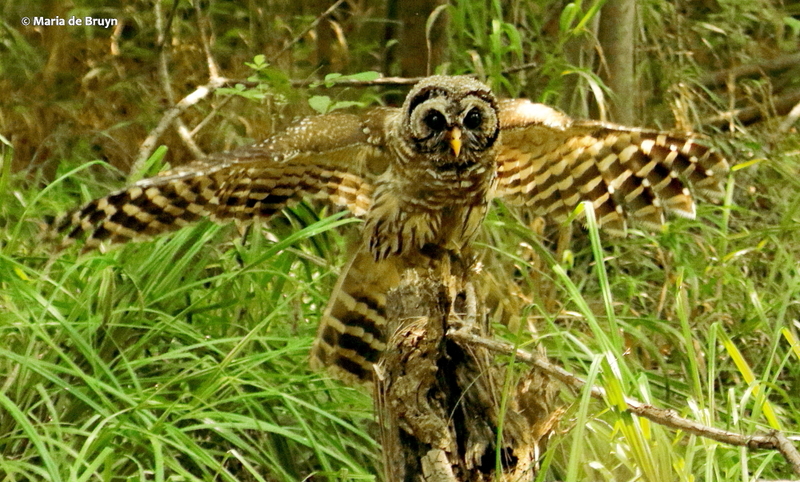 It appeared that the owl and caught something and s/he flew to a tree branch at the other side of the field. 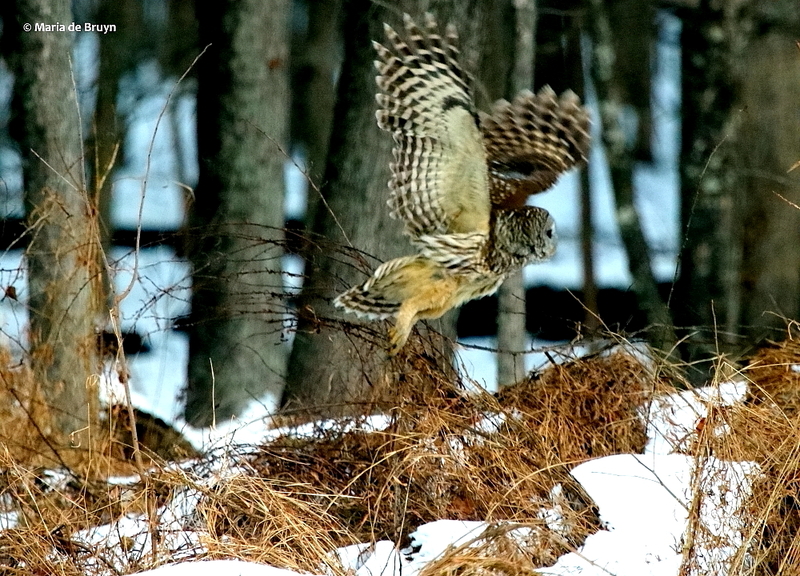 I happened to glance away in time to see the second Ollie flying toward and past us in the field on the other side of the path. 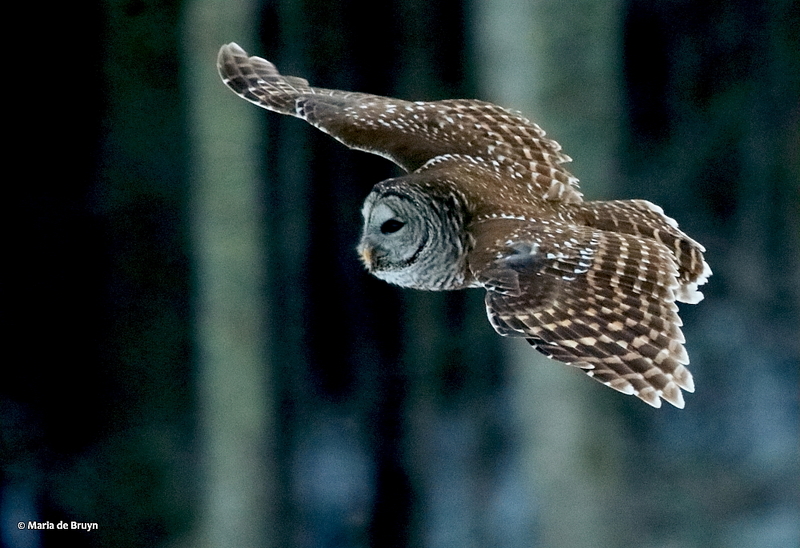 The owls fly completely silently so you have to be lucky to spot them. 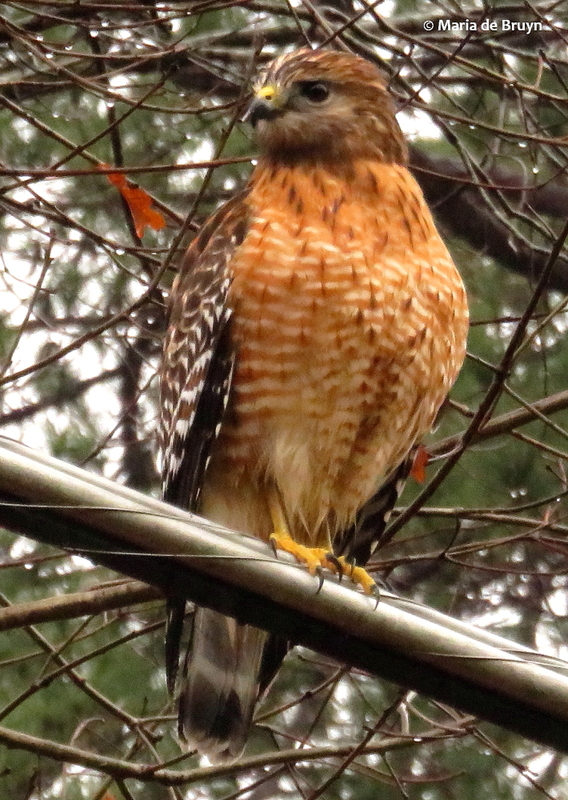 Although I’ve seen the pair fairly often now, I continue to find them really beautiful. 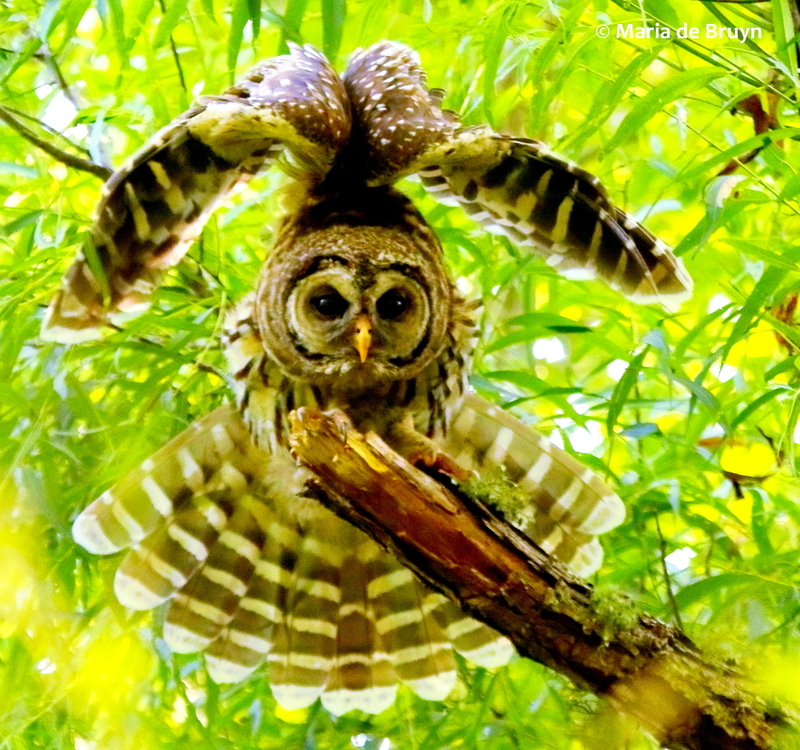 When they spot some prey, the owls drop quietly but swiftly down to pounce on the animal. 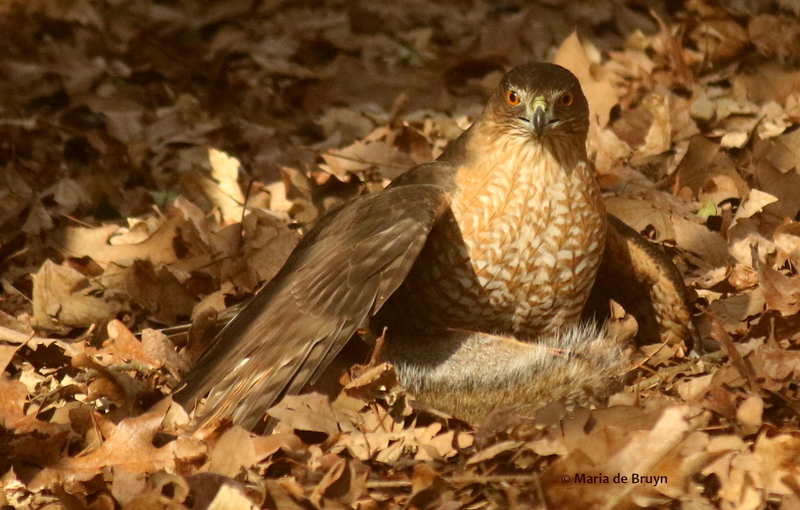 Sometimes they sit there for a minute or two, presumably swallowing the entire animal if it is small. 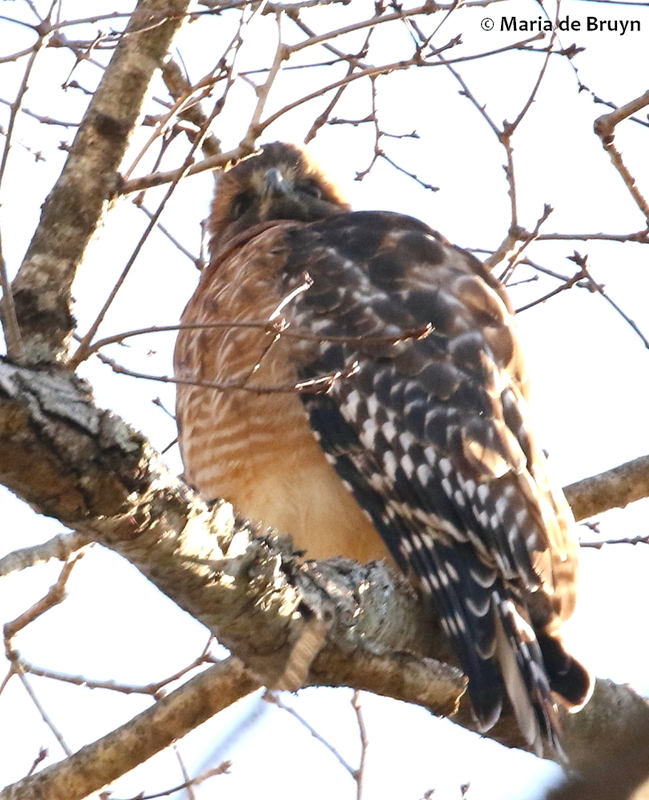 If it is larger, they will carry it off to have their meal in a tree. 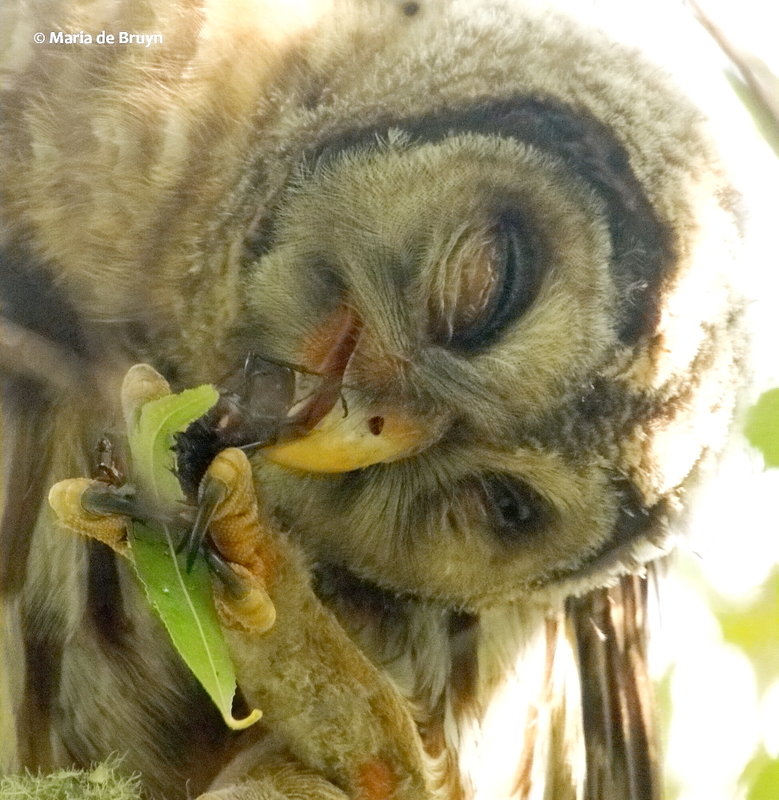 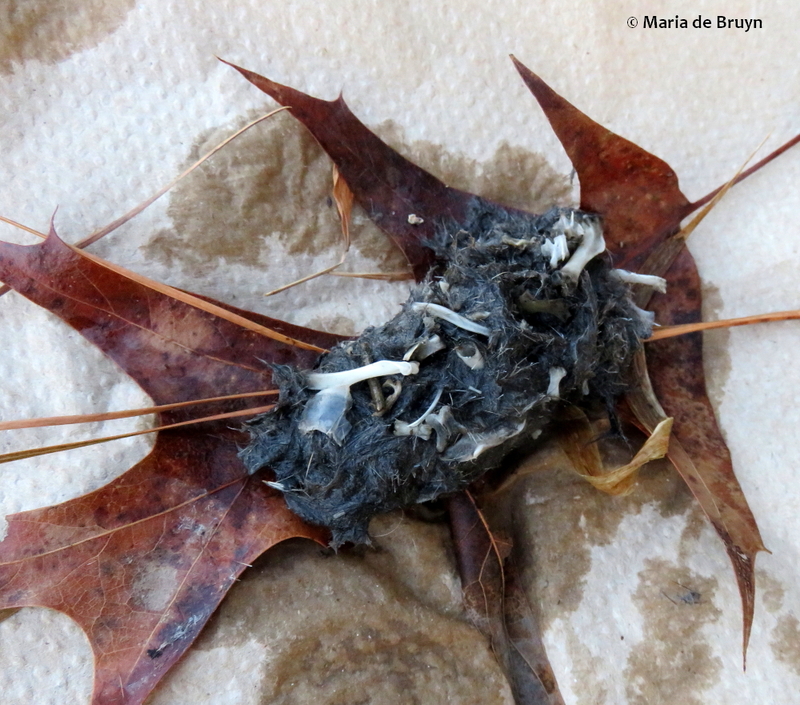 On one of our walks, Mary’s sharp eyes spotted an owl pellet and friend Lucretia and I dissected it. 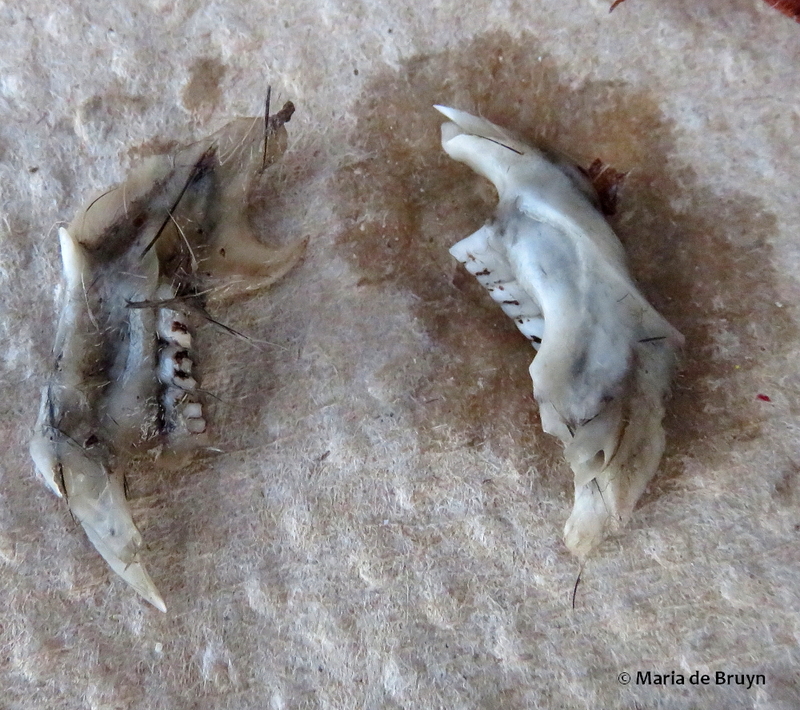 The pellets can contain the remains of several meals and we thought that a couple small animals’ remains were contained in the fur-covered mass. 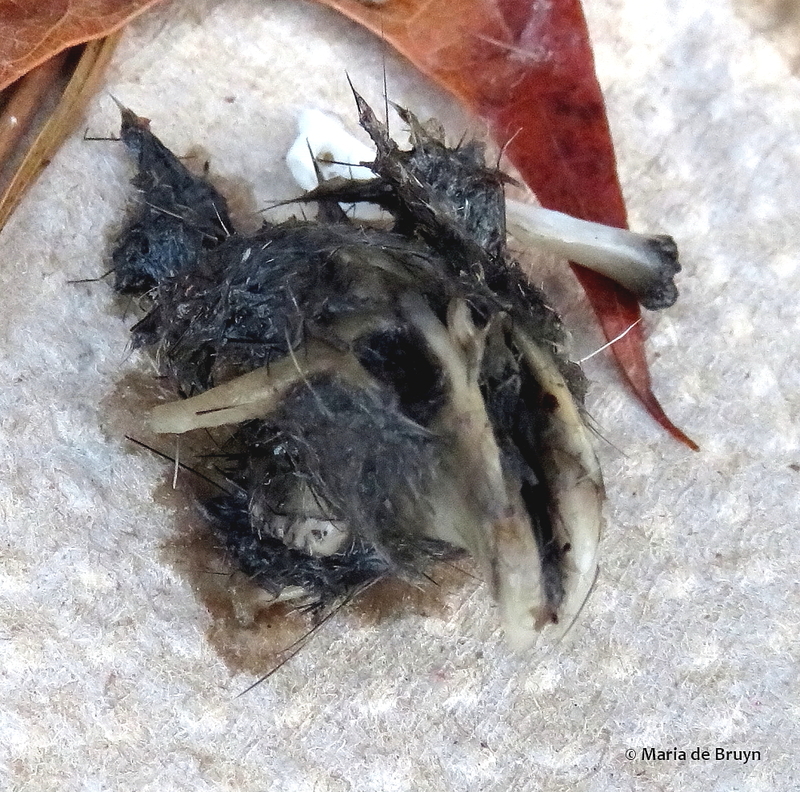 A tiny skull and pair of jaw bones with minuscule teeth could be distinguished – perhaps a vole or baby mole. 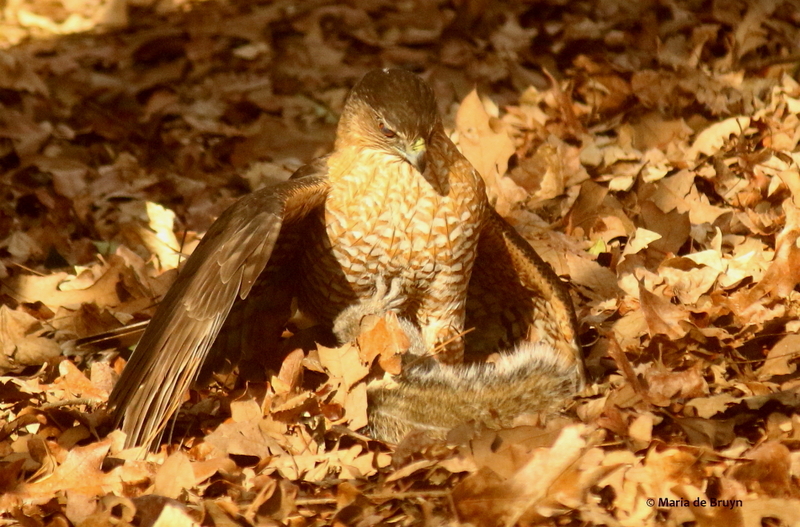 On one of my most recent spottings of Ollie, s/he was spending time taking little power naps in between ground scans. 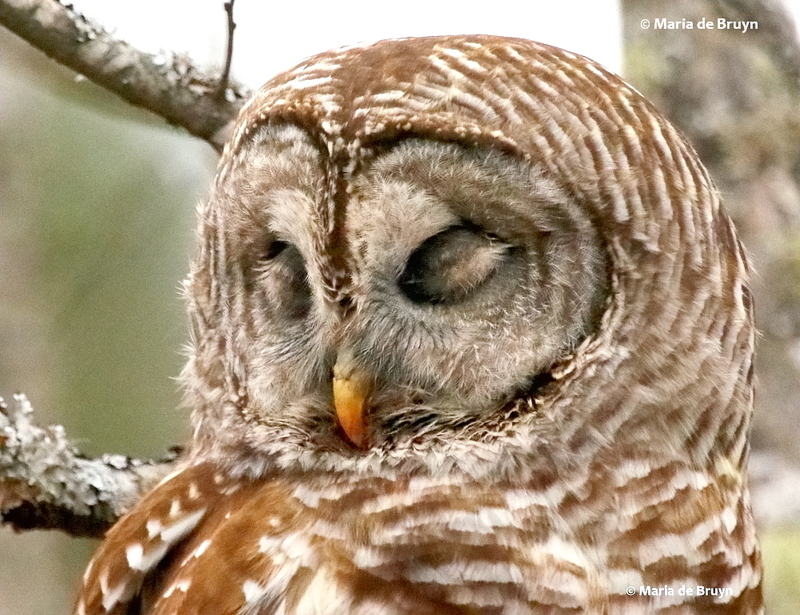 On other days, the owls had brief snoozing periods, too. 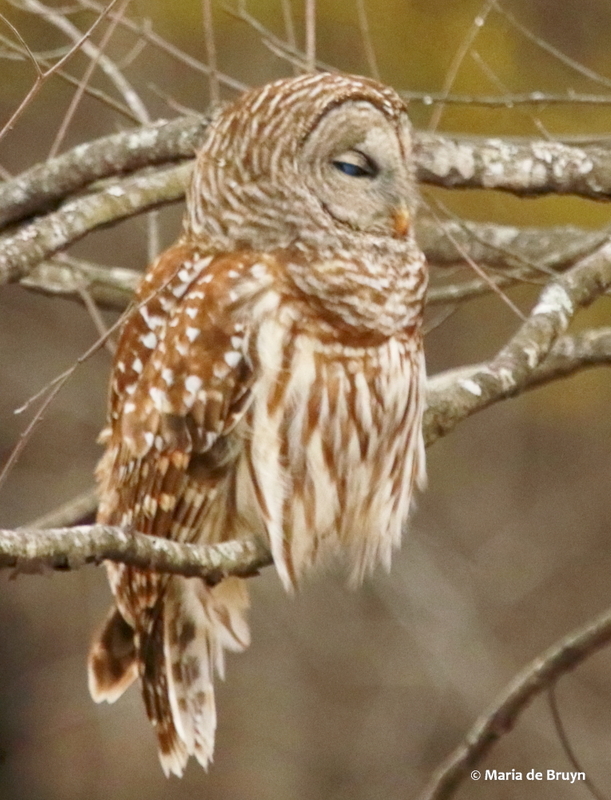 The feathers on their eyelids are very cool! 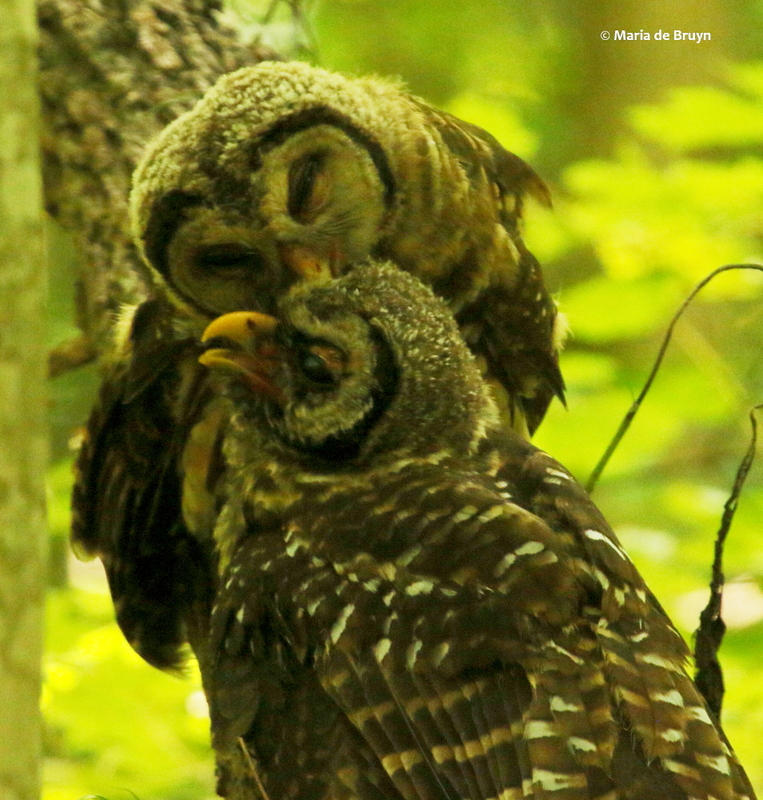 When a pair calls to one another, you can distinguish the male and female. 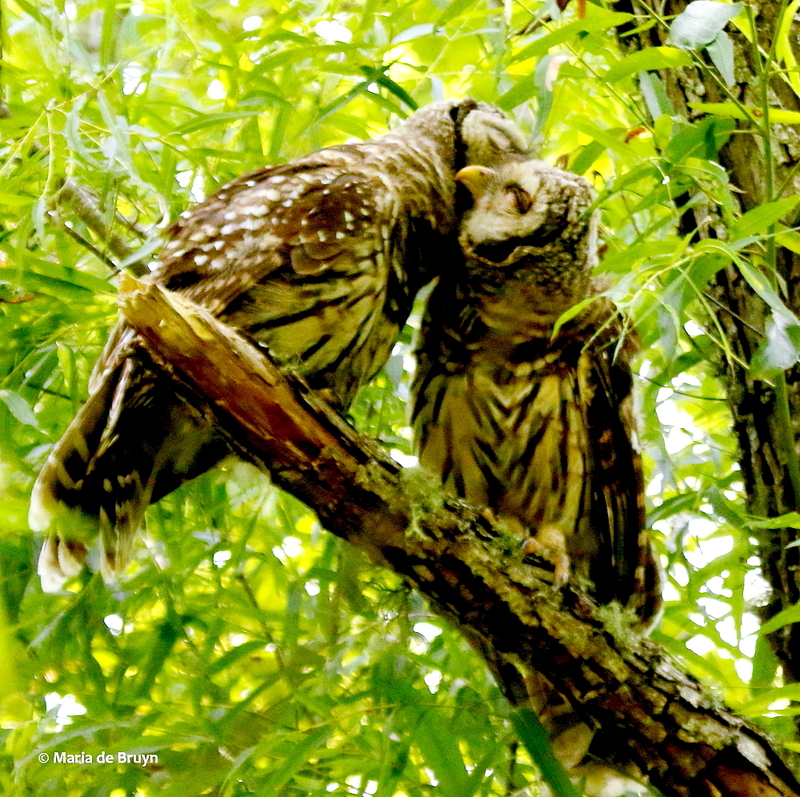 The male’s call ends abruptly while the female adds a little trill to the end of her call. 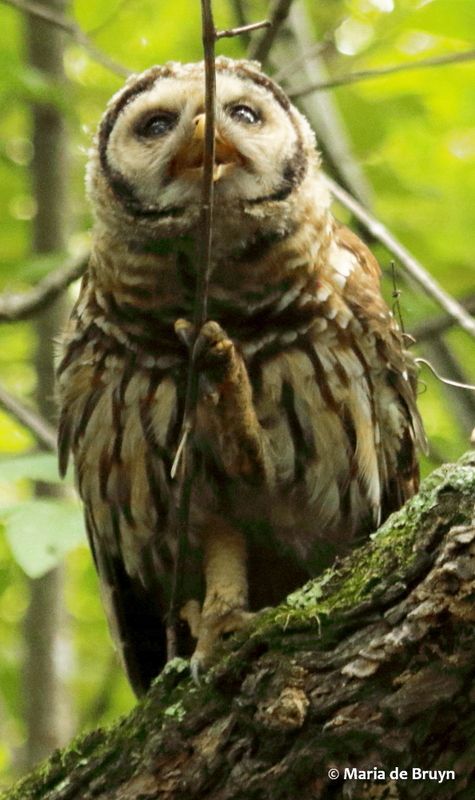 On my last foray to the reserve to see owls, I was following Ollie’s progress along the field when another birder spotted me taking photos. 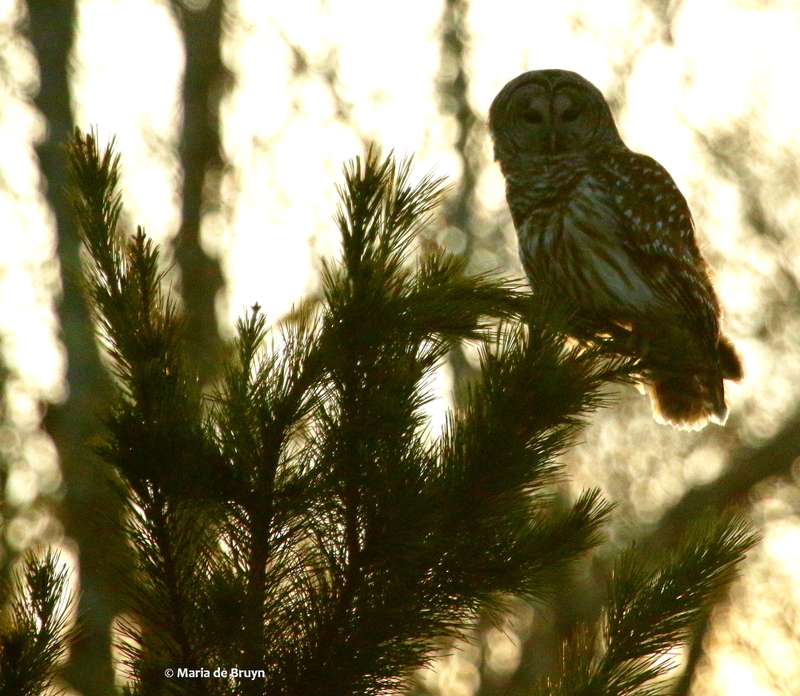 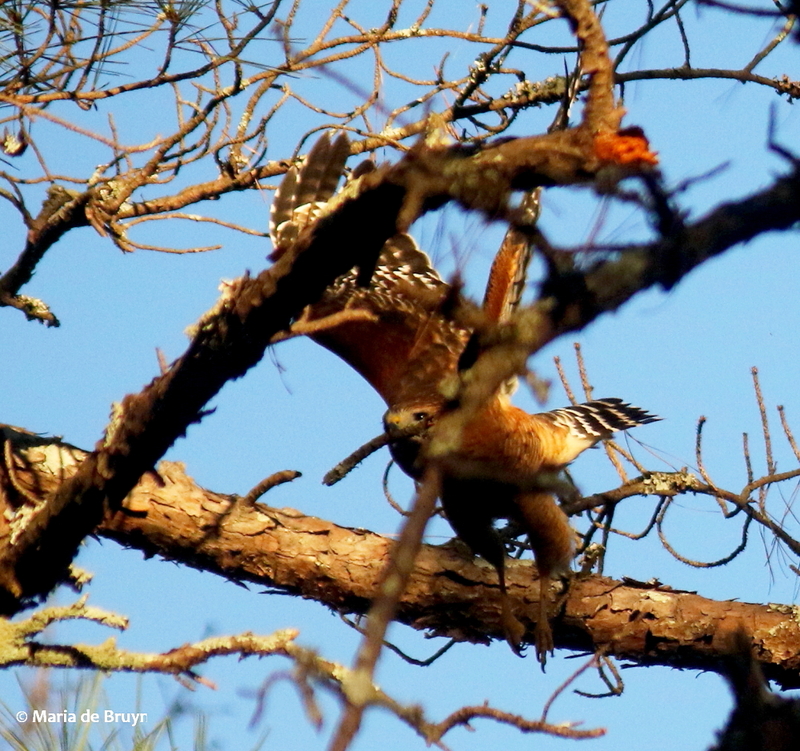 After a while, about six or seven walkers were watching and Ollie finally flew to the top of a pine tree not far from the path so they could all admire him/her. 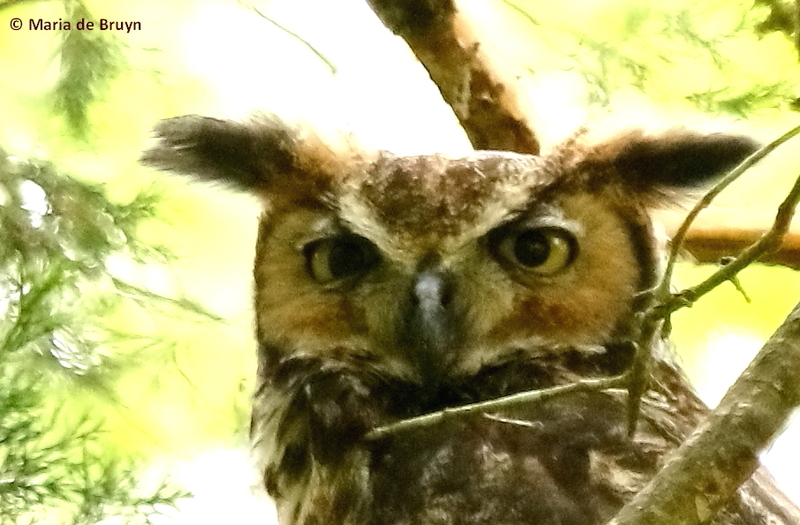 The one predator that goes after the large barred owls is the even larger great horned owl (Bubo virginianus). 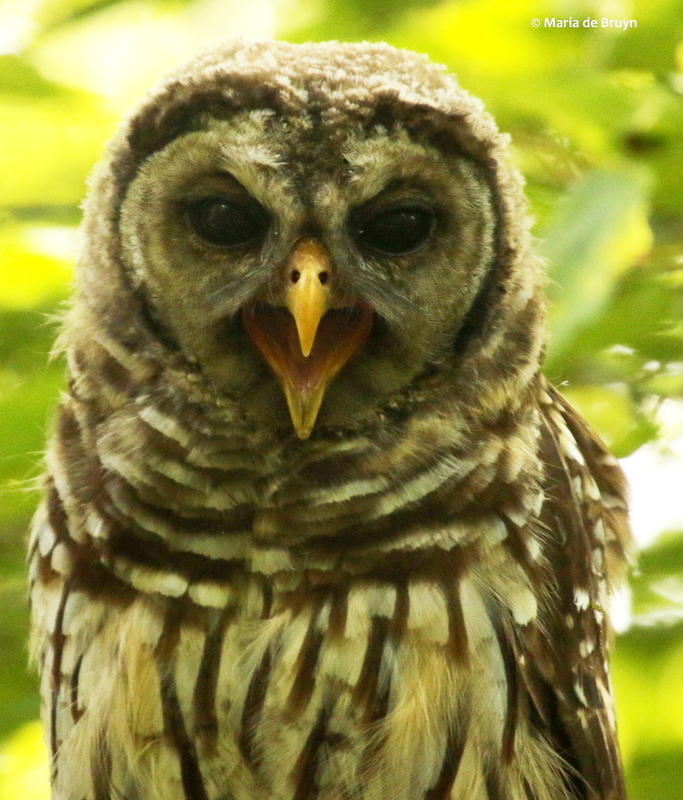 When people go too close to a barred owl’s nest, the owls will become agitated, so we should keep that in mind and not bother them there. 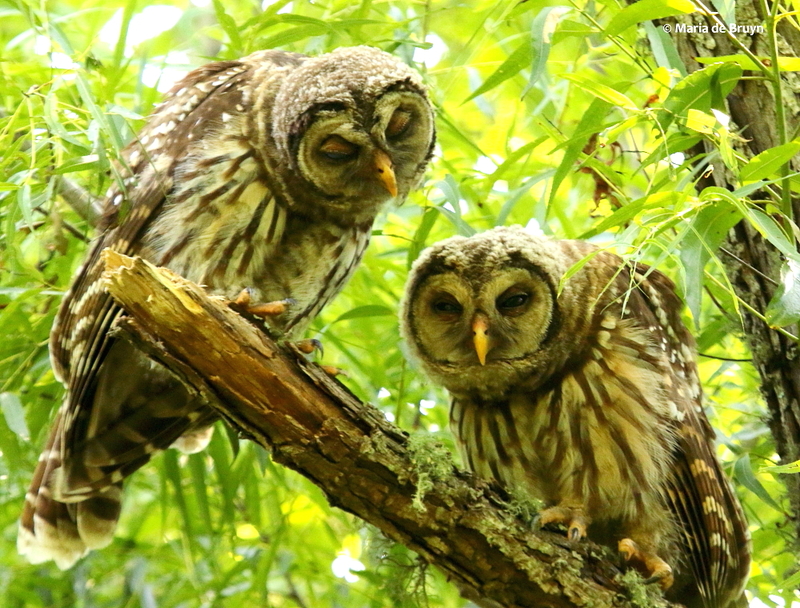 Oliver and Olivia seem not to mind people too much right now, since they will fly to perch near a path where people are passing. 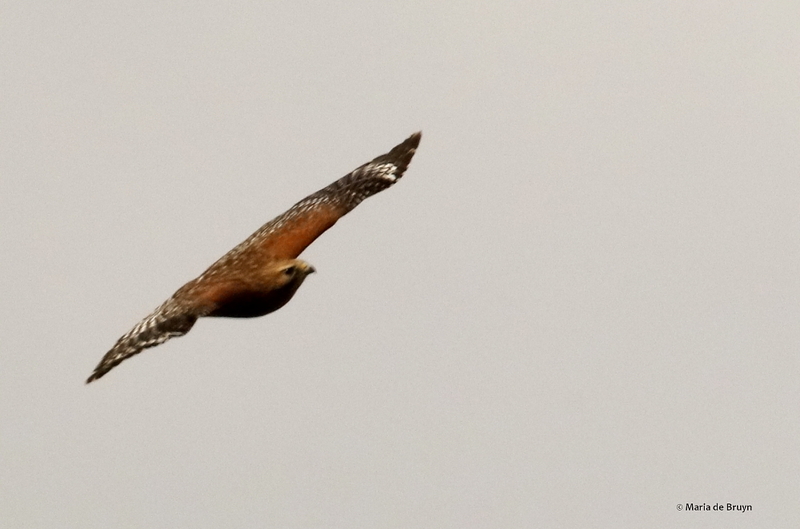 I do try to limit how much time I spend following them, though, even though they can fly away. 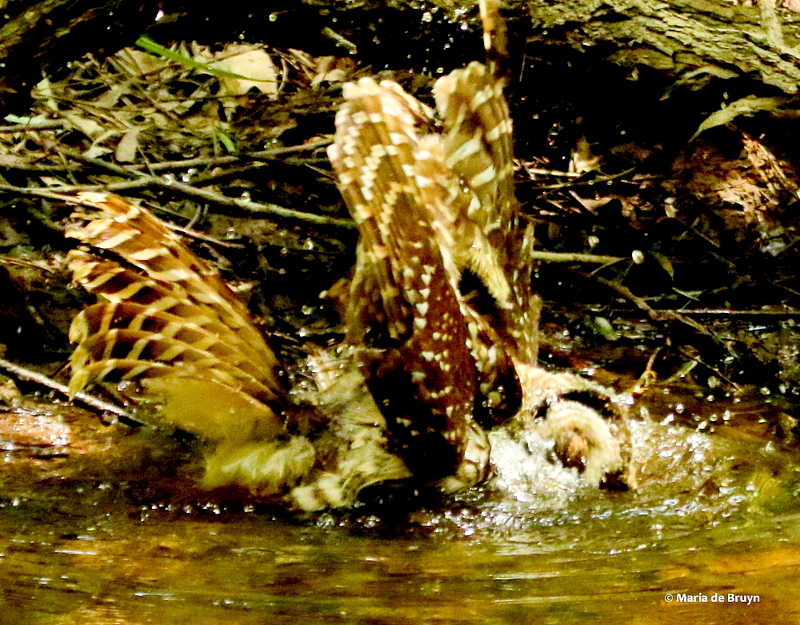 Just like us, the owls do want to be able to go about their business in peace!